I’ve been a big fan of Victron electrical components and the company for a long time since discovering them when I first bought our previous boat sv Learnativity in Sidney British Columbia back in 2005. 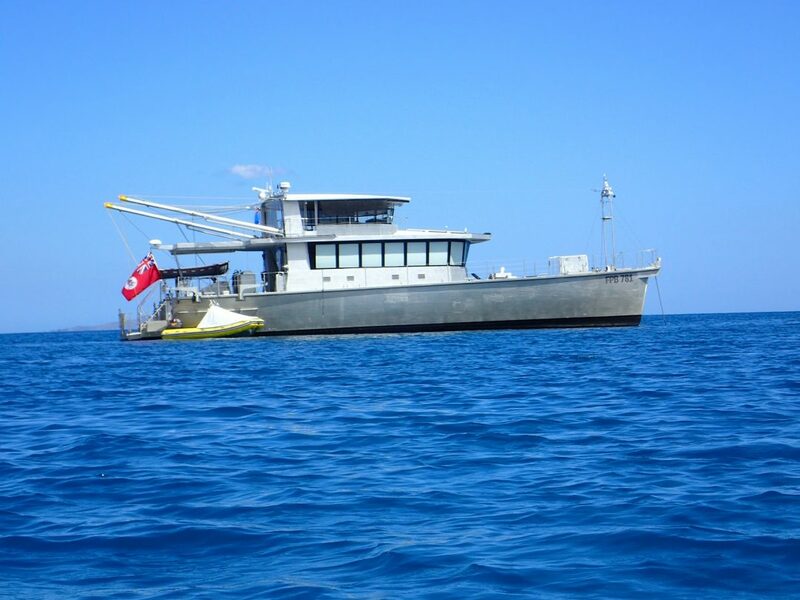 She was and still is a 1994 all steel 52’ Bruce Roberts designed cutter with a raised pilot house and was wonderfully overbuilt by a local builder in Sidney. After searching the world for my Goldilocks sailboat at that time, and my first boat ever, it made me smile to eventually find her a few miles the closest thing I ever had to a “home base” when I was growing up which was Victoria BC on Vancouver Island. I am an “Army brat” having been born into a military family in the sense that my Dad was a chef in the Canadian Army Service Corps and so we moved about every 2 years to a new base somewhere in Canada or Europe and I never grew up with an understanding of home being a building. Instead, home for me was wherever my family was and that’s remains my model to this day. A big reason why living full time aboard a boat has worked out so surprisingly well for me I guess. I spent the next two years doing a major refit to make her fully outfitted and up to the task of being sailed single handed around the world as that’s where I was headed. 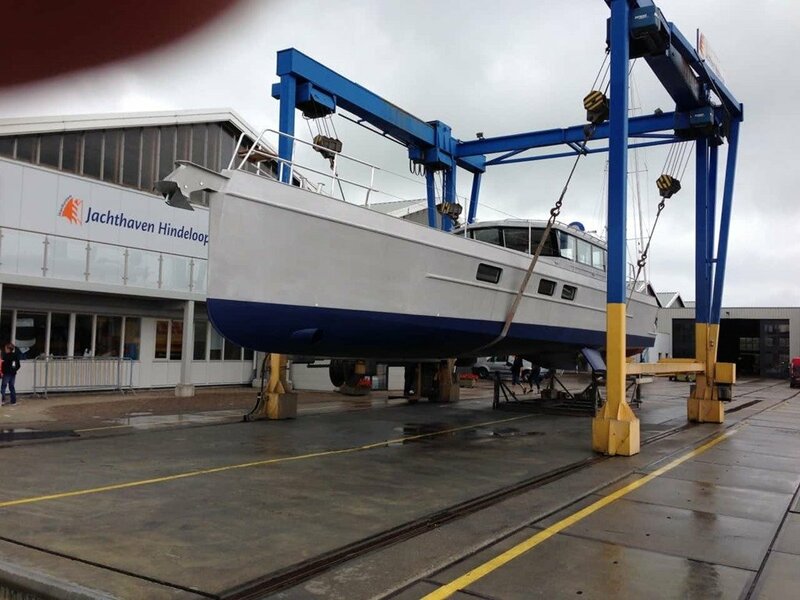 Part of this refit was a major upgrade to all the 1994 based electrical and electronic systems and that’s how I got to know Victron equipment. Learnativity was a word I had invented many years earlier and seemed like the just right name for this crazy adventure I was bound and determined to pursue. Amongst the endless list of things I learned over these past 13 years is how much of your safety and comfort at sea, and at anchor, depends upon electricity and so I gained a whole new appreciation for the value and significance of having a rock solid electrical system on any boat I was going to captain Möbius offers me an amazing new and rare opportunity to design and build the best possible electrical system based in large part on my past experience as well as what I am able to learn from others. There is a plethora of choices of manufacturers and we have the wonderful problem of too many good choices, but going with what I know to work well, and seeing them do things such as this support and adoption of Signal K, is why I’ve decided to go with Victron equipment on Möbius for things such as chargers, inverters, isolation and DC to DC transformers, solar MPPT controllers and battery monitoring systems. ** Just to be clear, and as with all decisions we make for designing, building and outfitting Möbius, what is “just right” is also “just for us” and not meant to imply that our choices should be what you or others do. 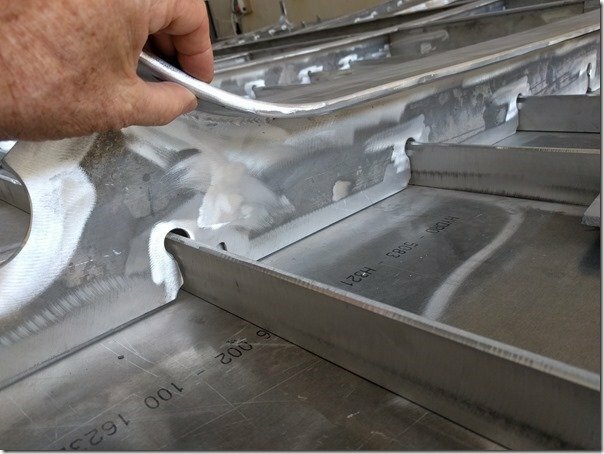 I have no affiliation with Victron or any other manufacturers so my interest here with these postings and this blog is simply to share our experiences and thinking as so many others have done on their blogs and books and sites which have played a huge part in our learning and decision making. OK, dismounting from this horse named Tangent, let me get back to the point of this article and my reference to Victron. Because I had such great experience with the Victron chargers, inverters, isolation transformer and battery monitors on Learnativity Christine and I have specified all Victron equipment for our new boat Möbius. I will write much more in future posts about our thinking and planning for the overall electrical system on Möbius in future posts, but I wanted to put this short one up after just reading this new posting on the Victron blog about Victron’s recent decision to join and support an open source initiative I’ve also been following for the past few years called “Signal K”. “Signal K is the next generation solution for marine data exchange. It not only allows for communication between instruments and sensors on board a single vessel, but also allows sharing of data between multiple boats, aids to navigation, bridges, marinas and other land-based resources. It is designed to be easily used by Web and Mobile applications and to connect modern boats to the Internet of Things”. Whether you are a boater or not I think we have all known the frustration of not being able to share data of many forms with others because the data is saved or transmitted in a format that is not compatible with the ones we are using. If we use the analogy of electricity this would be the ongoing frustrations and limitations any traveller knows when your physical plugs don’t match up be they AC plugs in the wall and at the ends of the cords on our electrical devices, or data connections such as USB, DVI, HDMI, serial, RJ45 and the list goes on almost to infinity it seems. And the data itself can be incompatible with other data as well which might be analogous to 120 vs 240 AC voltages, or 50 vs 60 Hz power. Standards are the answer to most of these issues but having worked within the international standards worlds of IEEE and ISO for almost 20 years in a previous life, we used to have the not so amusingly say that “The great thing about standards is that we have so many of them!”. Still an all too real problem today and one which I’m personally dealing with on my personal devices such as my Nexus phone and Lenovo laptop which both use the newest iteration of USB C for all their data and some power connections. USB-C is great, small, reversible, fast, covers data, sound, video and power. BUT of course it doesn’t help when my other devices and cords use previous versions of USB A, B, mini, etc. As I said, we ALL know this all too well. In the marine world these challenges have been and continue to be with both the physical connections and the data formats and transmission standards. The advent of NMEA 0183 was a huge leap forward from a mostly all proprietary past and this was then updated to NMEA 2000 or N2K as it is often abbreviated. I went through this transition on Learnativity and learned a great deal not the least of which was a great desire for the next leap forward to whatever the next standard would be. As you may know and will read in John’s article, while NMEA 2000 has been and remains a huge help with interconnectivity of the many devices on our boats, it has some significant limitations not only technically but with the standard itself being quite closed and limited to development and improvements mostly by the manufacturing community. Kudos to this community for the truly immense and difficult work they have done and their solutions have really revolutionised setting up and maintaining and using electrical devices and signals on our boats. However if there were to be a truly “open standard” which anyone could support then as history has clearly demonstrated I think, such a standard would progress much faster and benefit far more people, companies and organisations. And THAT is what Signal K, amongst several others, is all about. The biggest challenge I would opine, lies within the “amongst several others” part of that last sentence. For standards themselves are NOT the true solution, the ADOPTION of standards is when things really improve. Going back to the electrical standards while it is very helpful that within one country or region there is usually a common standard for the AC plugs and receptacles, but as soon as you travel outside these areas you quickly experience the “many standards to chose from” problem and you end up carrying a whole bag full of just power adaptors to go along with your bag full of USB adaptors and converters. What would be REALLY revolutionary and powerful is to have ONE standard become the defacto standard for all these and that is what Signal K and more so this Victron support outlined in this article above is all about. You don’t need to know the intricacies of the Signal K standard itself, I certainly don’t, to appreciate the potential of having this, or any other standard for that matter, become a defacto standard. A standard that would be adopted by all manufacturers and available to all of us to use and benefit from. Hence my excitement and support for Victron in joining forces with Signal K by choosing to adopt it and support it within their product development going forward. I certainly have no idea if Signal K is up to this daunting challenge, nor that it will be widely let alone universally adopted by manufacturers. 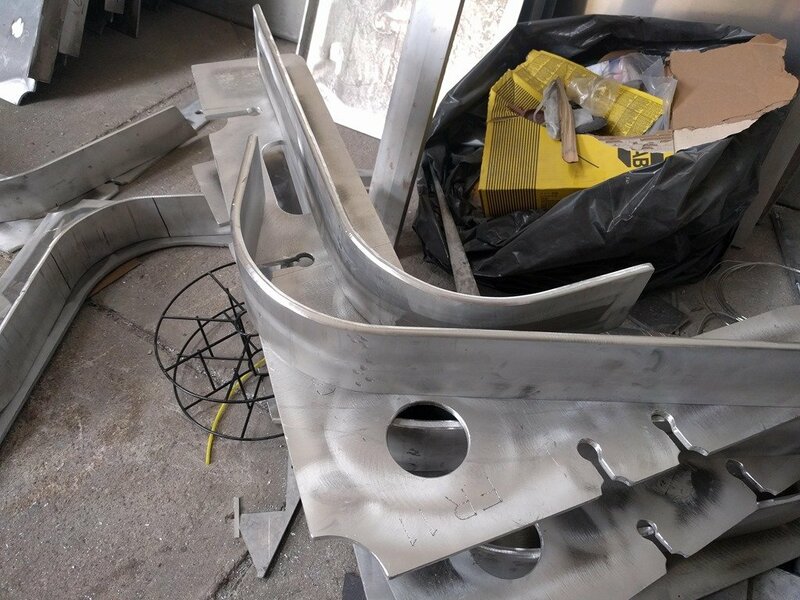 As you’ll read in the article it is very much undecided if the manufacturing community will adopt Signal K and the Signal K standard itself is still very much in the early stages of development but all great journeys are born out of such small steps. I can however appreciate the promise and do my best to promote and encourage things like Victron’s adoption and support for Signal K and hence this posting so you too can be aware and consider ways you might assist with realising this form of electrical and data nirvana. 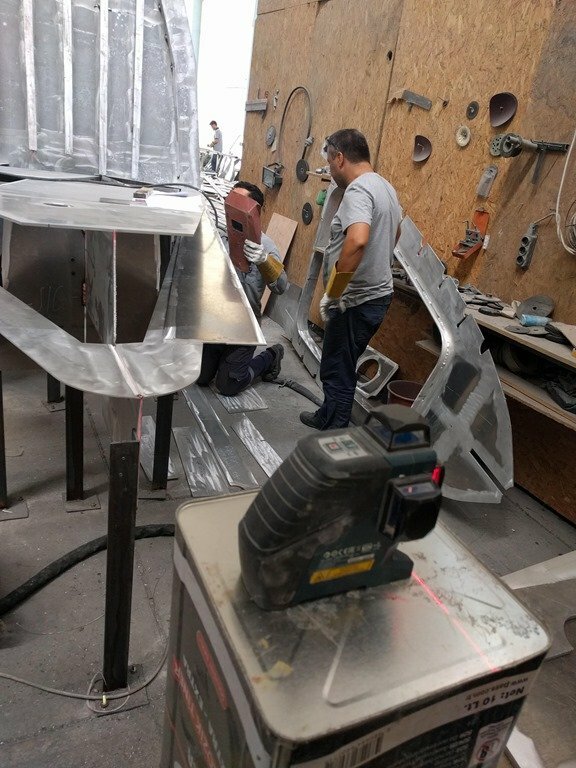 It took us a long time to find the just right Goldilocks designer for our new boat Möbius, but we knew we’d found him almost instantly when we first started talking with Dennis Harjamaa at Artnautica Yacht Design. One of the many things which sets Dennis apart from most other naval architects and designers, and made him the perfect fit for us, is that he not only designed the first LRC58 to be his own boat, he also built it almost entirely single handed and has lived aboard full time with his wonderful partner Raquel ever since launching “Koti” (Finnish for home) in beautiful Auckland New Zealand. Dennis’ LRC58 design caught more than our attention and three other LRC58’s have now been built in different yards around the world and Christine and I have been fortunate enough to spend time on two of these in our travels the past two years. 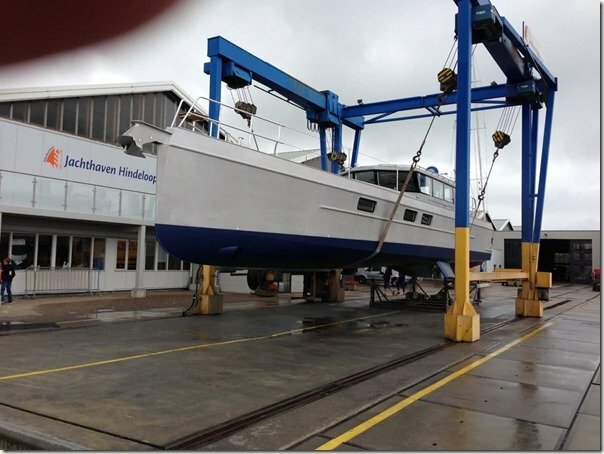 The most recent LRC58-3 launched last July at Aluboot (www.aluboot.nl) in Hindeloopen, The Netherlands and her owner Rob Westermann , who was a very hands on part of the build, could not be prouder or happier. Rob has very appropriately named her mv Britt. 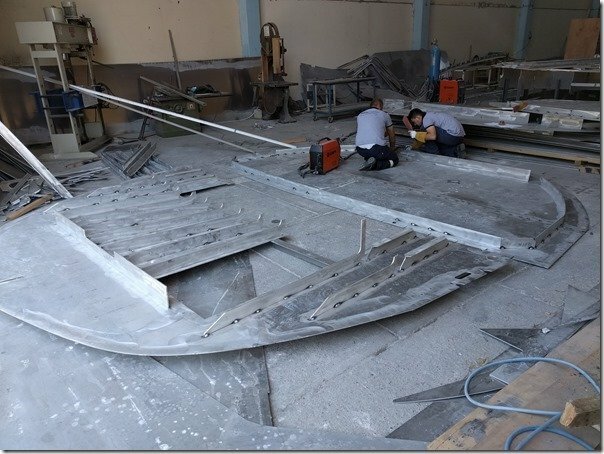 Rob managed to find time to photograph and blog throughout the build and you can find all that and a full description of this boat at the EU site for Artnautica. Related to this, and another truly phenomenal resource is the blog of mv Dirona, a 2010 Nordhaven 52 profusely populated with excellent articles by a couple who are fellow live aboard passage making explorers, James and Jennifer Hamilton. I mention James and Jennifer not only to point you to their treasure trove of a blog but also because they have been cruising around the UK and northern Europe the past few months and on their way to a berth in Harlingen in The Netherlands, they passed Britt which caught their interest immediately. Rob invited them aboard for a full tour which James in typical fashion photographed and wrote about in this thorough posting describing his impressions and what he found aboard Britt. I think you will find this a great use of your time to read, just be forewarned that once you start exploring James & Jennifer’s site you won’t likely get much else done for the rest of the day. 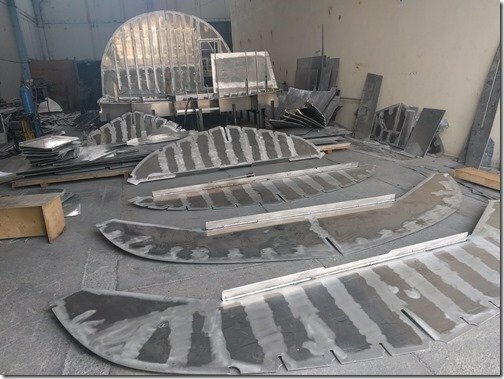 One of their other postings I think you might find particularly worthwhile while we are on this theme of these long and skinny all aluminum ocean crossing passage makers, is the similar overview James posted after he and Jennifer spent time with Steve and Linda Dashew aboard their truly awemazing FPB 781 Cochise. Most of you would probably know all about these ground breaking boats from the SetSail blog which Steve has been lavishly posting to for more than a decade with the intricate details of their entire journey from a life of sailing to designing and building the most famous of these kinds of boats, the FPB series. 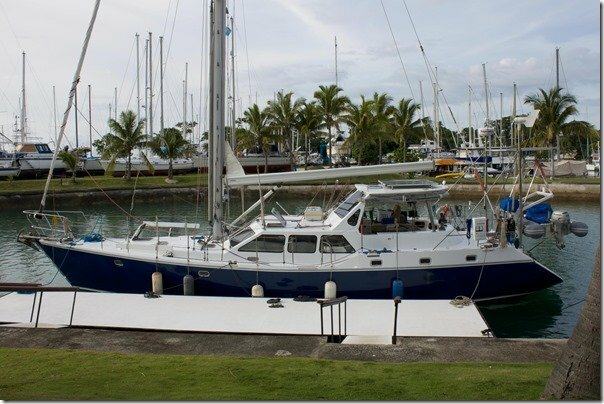 You may have read Christine’s March post here “Meeting Steve” about her serendipitous meeting with Steve and Cochise back in September 2016 when we were finishing our big renovation of our 52’ steel sailboat sv Learnativity in Vuda Point Marina in Fiji. 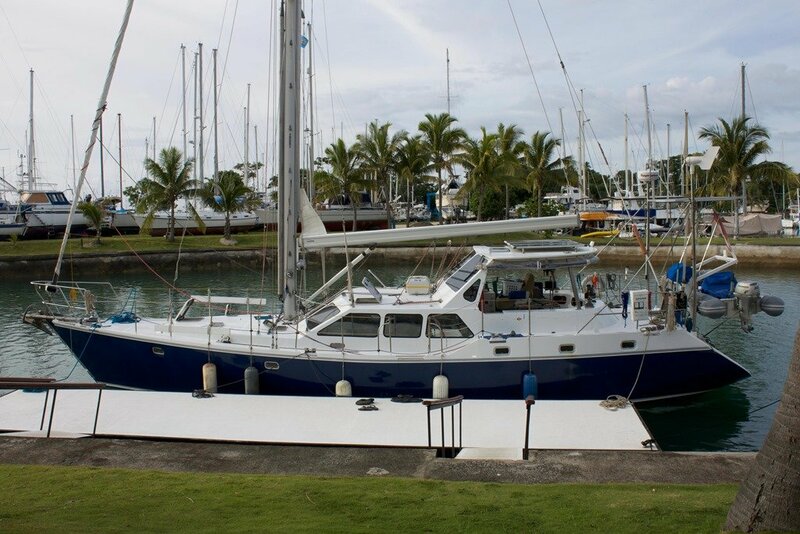 Steve and Linda had Cochise out on what they thought was going to be a round trip passage from where they built all their FPB’s at Circa in Whangarei New Zealand up to Fiji for an extended set of sea trials and anchored just outside Vuda Pt. Marina. So Christine and Barney paddled out to say Hi and get a closer look at Cochise and she tells that whole story in her post. 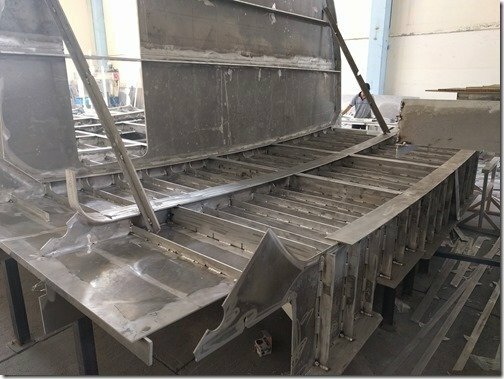 While certainly still relatively small in numbers compared to trawler style passage makers such as Fleming’s, Nordhavn’s, Selene’s and the like, this new “family” of long lean efficient all aluminium passage makers is certainly growing both in numbers and in variation on this theme. A “family name” has not yet evolved for these type of boats but I suspect it will over time. In the interim there are more and more people who, like Christine and myself, have been inspired and enlightened by this nameless and growing family of boats now out exploring the world’s oceans and even more so by their energetic and innovative designers, builders and owners. We’ve been long time and long range live aboard world passage makers and thought we would continue to wander, ponder and wonder at this awemazing world of ours one nautical smile at a time under sail indefinitely. However, the newfound challenges and adventures of voyaging under power aboard one of these new family of boats with their shared set of characteristics and this relatively new ability for a couple to easily cross oceans safely, comfortably and efficiently under power, has inspired and seduced us into doing what we’ve always done, which is to go wherever is calling our hearts and minds the loudest. Möbius is how we have decided to answer these calls and set sail on this whole new journey. We started this journey about three years ago and as you can tell, it has completely captivated and delighted us already. Thanks to finding Dennis, Baris and Dincer at Artnautica and Naval Yachts to form “Team Möbius” with us and bravely take on this collaborative work of art and engineering, we can’t wait to launch Möbius next year and be back at sea again to join these other family members in secluded anchorages around the world. 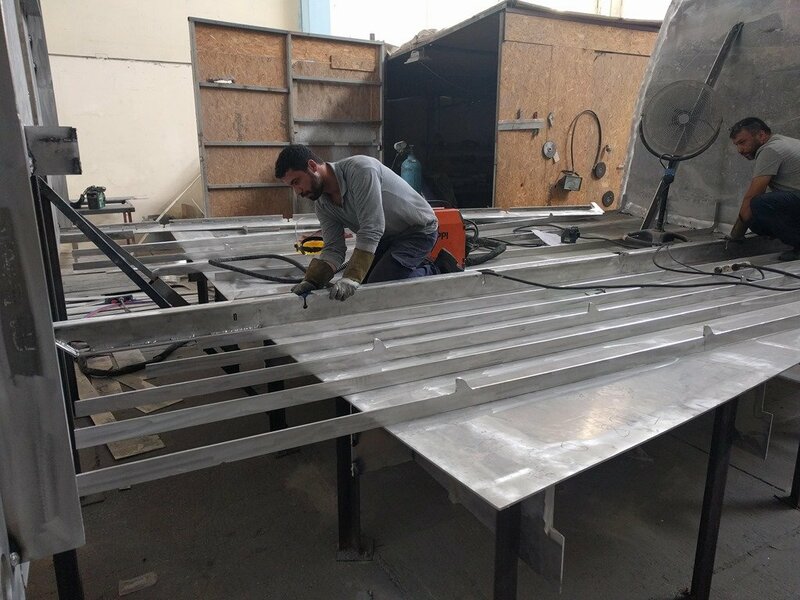 Another week goes whizzing by faster than a MIG welding flash and with lots more progress on the building of the hull for our new boat and soon to be full time home, the mv (motor vessel) Möbius, our all aluminiuum 24m / 78’ eXtreme eXpedition Passage Maker or XPM here at GreeNaval Yachts in the Antalya Free Zone. Thanks for your interest and welcome aboard. I will continue with the usual style of a series of annotated photos taken throughout the week and end with a similar video version that compiles the videos I shot during the week. Hope you enjoy and please be sure to leave your comments, thumbs up/down and questions in the comments section at the end. As per the title of this week’s post there is a lot of “baffling” work going on as Team Möbius begins assembling the fuel and water tanks which will soon form the entire below waterline portion of the hull, as well as assembling the framework for the bow section of the hull and continuing to finish the welding all the stringers and bulkhead frames to the deck plates which were put in place last week. Lots to cover so let’s jump right in starting with the baffling part first. 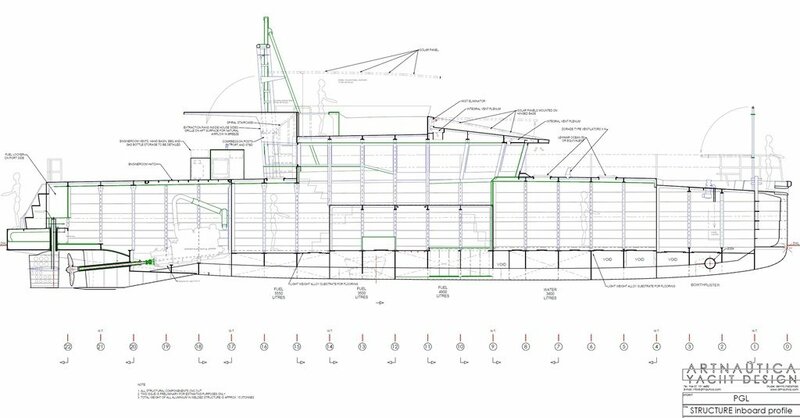 With the eXtreme amounts of liquids we want to carry on Möbius for ocean crossing passage making, the hull has been designed such that pretty much everything below the WL (water line) is filled with either water or diesel fuel. I’ve done a quick colouring of the profile view to the left to help you see how this is all positioned. In total we will be able to carry about 14,000 litres/ 3700 USgals of diesel and up to 5700 L / 1500 USG of water. 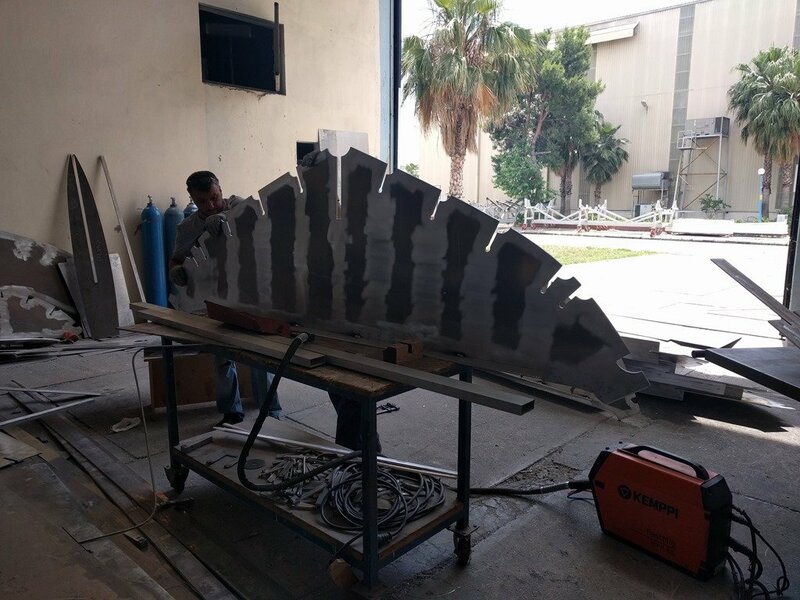 The water will all be potable, as we only fill them with the close to pure H2O generated by our high volume watermaker which makes about 220 L/hr 60 USG/hr. However the for such a large tankage of water onboard is primarily to serve as movable ballast. 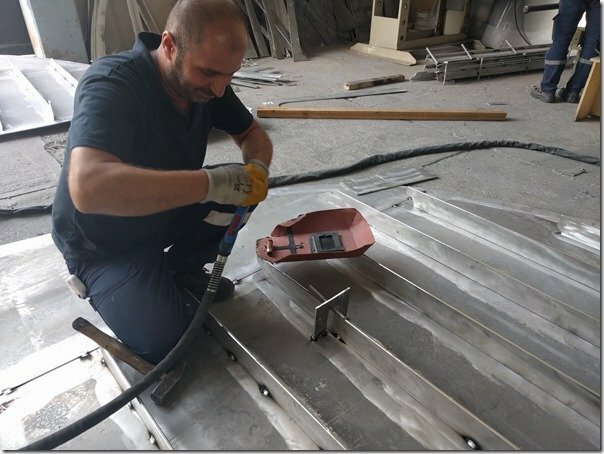 This enables us to trim the boat for different sea conditions as well as balance weight as the fuel is used up. All tanks are divided up into multiple independent compartments with plumbing and valves which enable us to move both water and fuel from any tank to any other tank as needed. Stripping away everything but the framework (sorry Möbius) I’ve taken these two snips of the 3D model, this one looking up from below the WL shows some of the transverse and longitudinal baffles in Red …. …. and this one looking from above showing the grid like arrangement of the framing for the tanks. The magenta surfaces are the tank tops and all the green squares are tank access hatches. 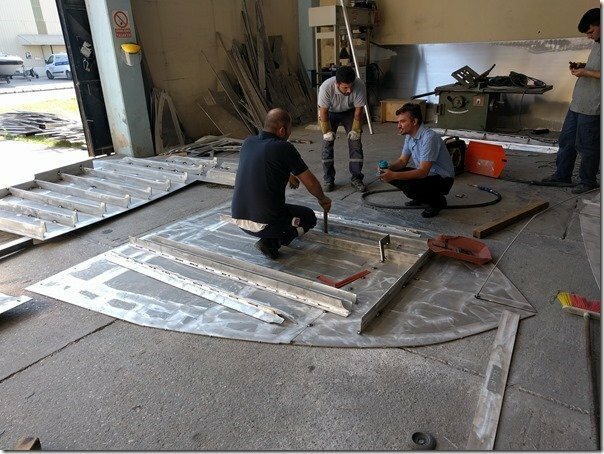 The access hatch holes were not CNC cut because we will wait until we finalise the interior arrangements to decide exactly where they will go in order to provide full access to every area within all the baffled compartments for future inspection and maintenance. 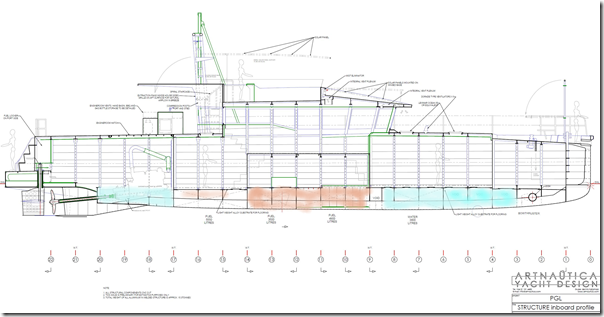 As you can see, this integral grid like structure makes the underwater portion of the hull eXtremely stiff and strong. Furthermore, with all of the hull below the WL being tanks we have a significant built in safety factor in the very unlikely event that something should puncture the thick hull plates. A feature we definately hope not to test out! 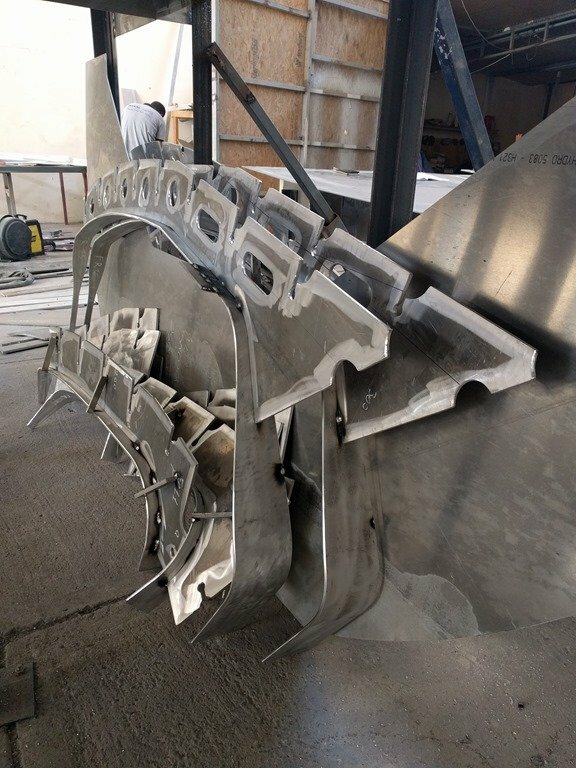 I wasn’t kidding in the title, this kind of tank construction requires a LOT of baffles! Here is one of the many piles of baffle wannabes …………..
…… and another, growing all over the shop floor like mushrooms as the week progressed. 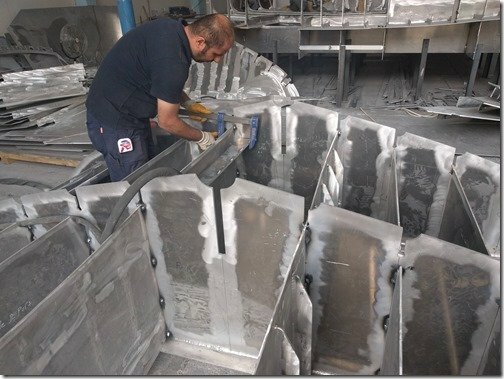 Free surface effect is the change in stability of a vessel caused by liquids moving about freely in a tank or hold. As a vessel rolls, liquids in tanks or breached compartments accentuate the roll by moving freely from side to side of the tank accumulating first on one side and then the other, and may adversely affect the stability of the ship. The free service effect can be reduced by having baffles in a tank to reduce the free movement or by either emptying the tank or filling it completely. Given the enormous quantities of diesel and water we will be carrying on Möbius you can understand why we treat this with extreme care and seriousness as it can cause serious instability as noted in the definition above when we are at sea. 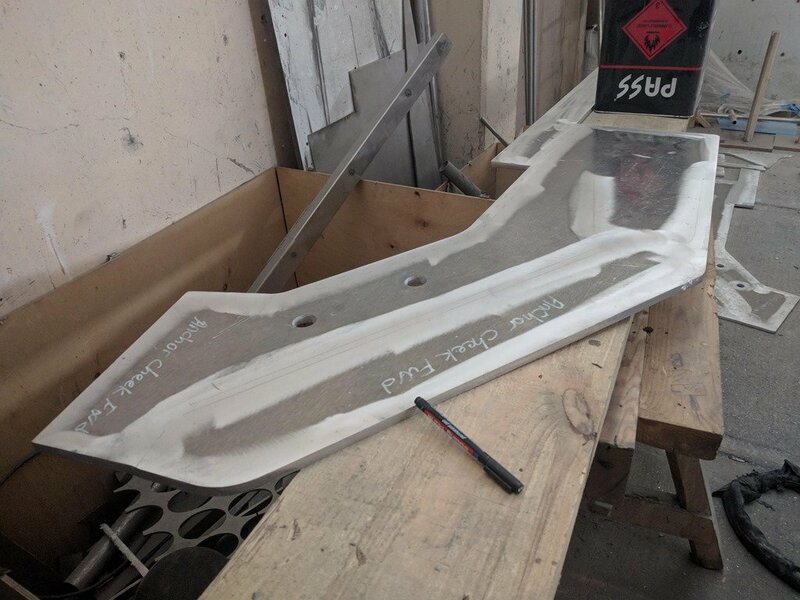 Fortunately the solution is relatively simple, divide the tankage into multiple independent tanks and put lots of baffles in every tank to reduce the free surface effect. 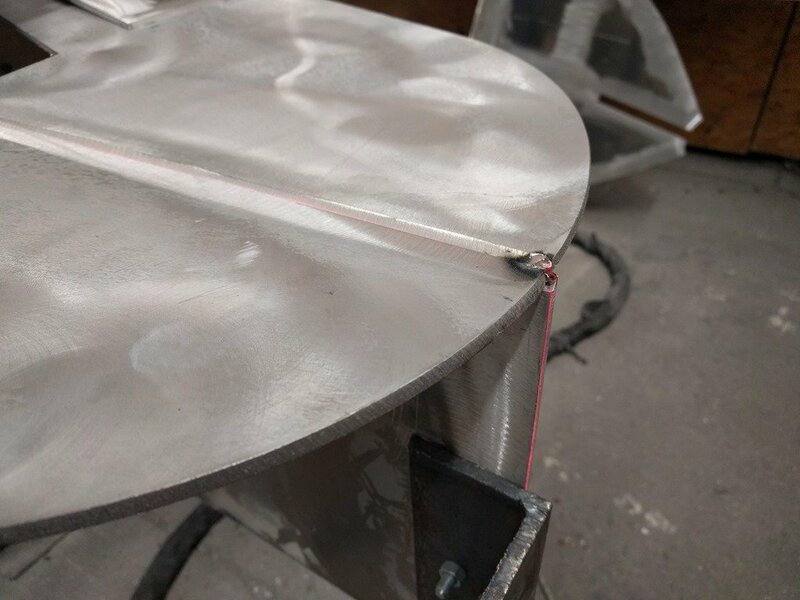 The top edge of each baffle plate has a 10mm flat bar welded on to provide a surface for welding the tank tops onto after the hull is completed. 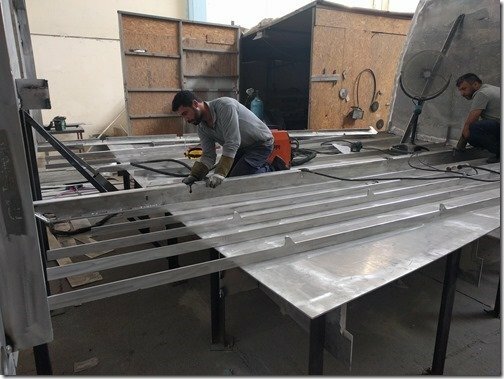 Our head welder Sezgin was kept busy welding these flat bars as well as continuing to weld all the stringers that were installed last week onto the deck plates so it was a very busy week for Sezgin and he is very fast and very good. 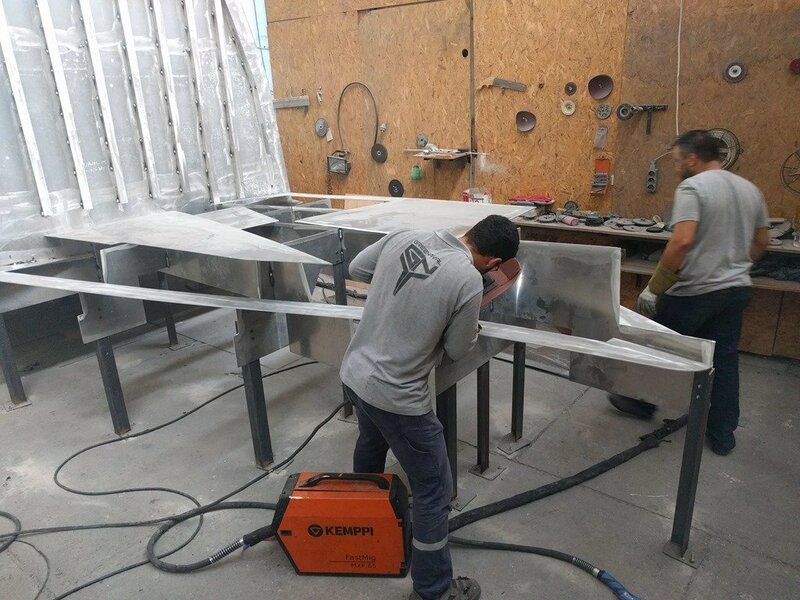 Other Team Möbius welders were busy cranking out more baffles for Sezgin by tacking the flat bar onto the top edges of baffles. You can see how they tack diagonal braces to hold the bar and plate perpendicular when they are being fully welded in place. 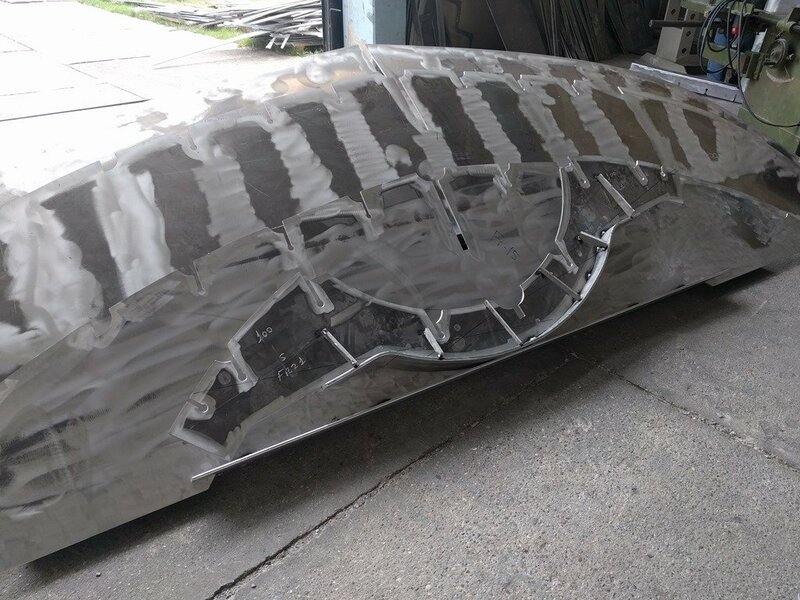 Along the centerline of the hull the tanks are divided to create separate tanks on each side and in some places a “void” or space between them is created such as in the middle area of the hull where the large “house bank” of 2v battery cells will go. 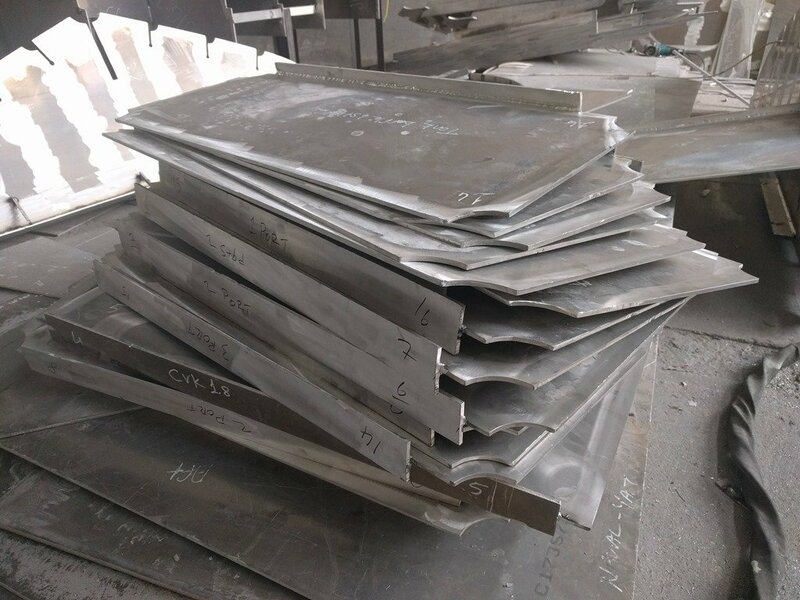 So some of these are not baffles per se as they form sides of the tanks in these places and must be reinforced further with stiffeners similar to the style you saw in the bulkhead construction. Here you can see one such baffle plate with the stiffeners tacked in place ready to be fully welded with a continuous bead. 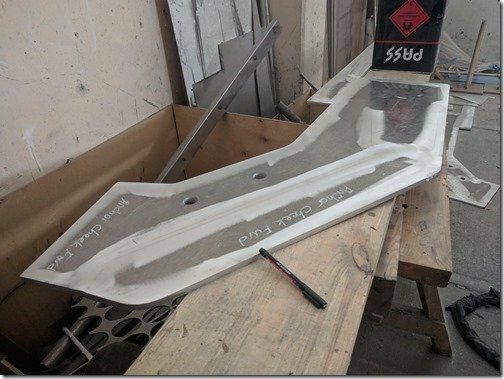 For scale, my thumb is on a piece of 12mm flat bar and the stiffeners are 10mm. 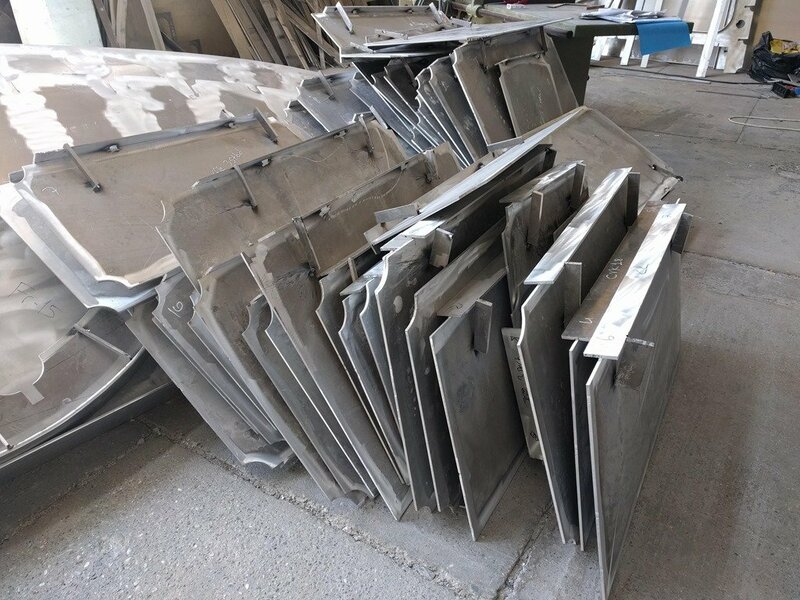 Here is a stack of tank side plates stacked up and ready for assembly. The baffles run longitudinally or lengthwise in the hull and are notched or welded into the transverse running frames such as these ones stacked up here. 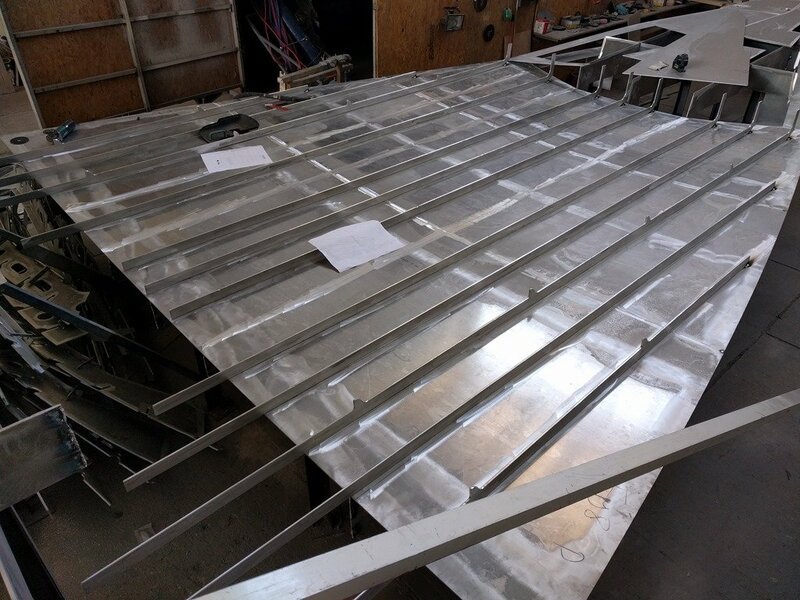 The frames are spaced one meter apart along the entire length of the hull. 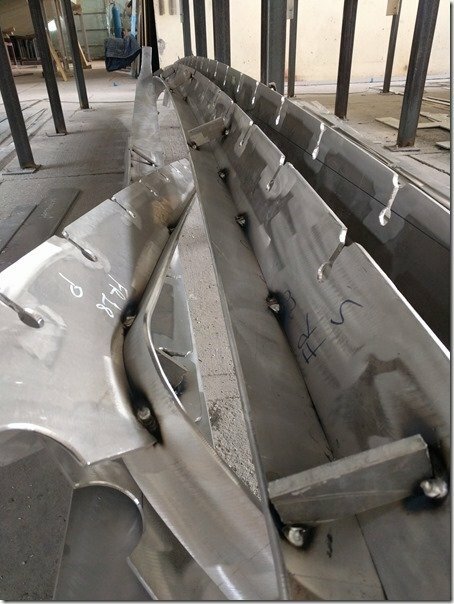 Here are some of the bottoms of these frames with their temporary flat bars tacked in place to keep them flat while being worked on and welded. 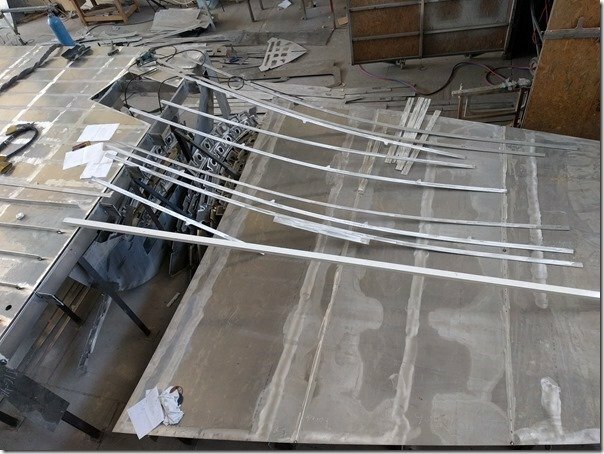 You can see all the slots cut into their outer edges the stringers which will be slide in there once these frames have been positioned along the length of the keel. 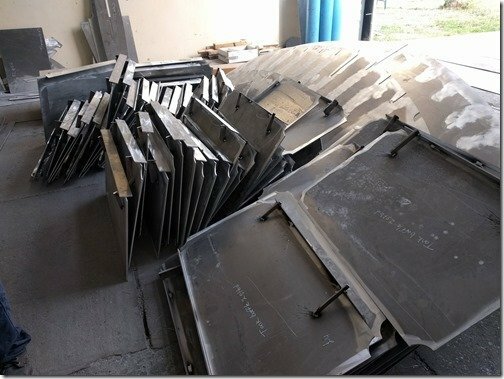 Several of the frame bottoms laid out on the shop floor in ready to be stood up and turned into tank subassemblies. First step in building the tank assemblies is to tack the first set of baffles in place. On the left of this shot closer to the center of this frame bottom, you can see one of the tank side plates mentioned above with its stiffeners welded in. This will give you more sense of scale with Enver standing inside one of the tank cavities. 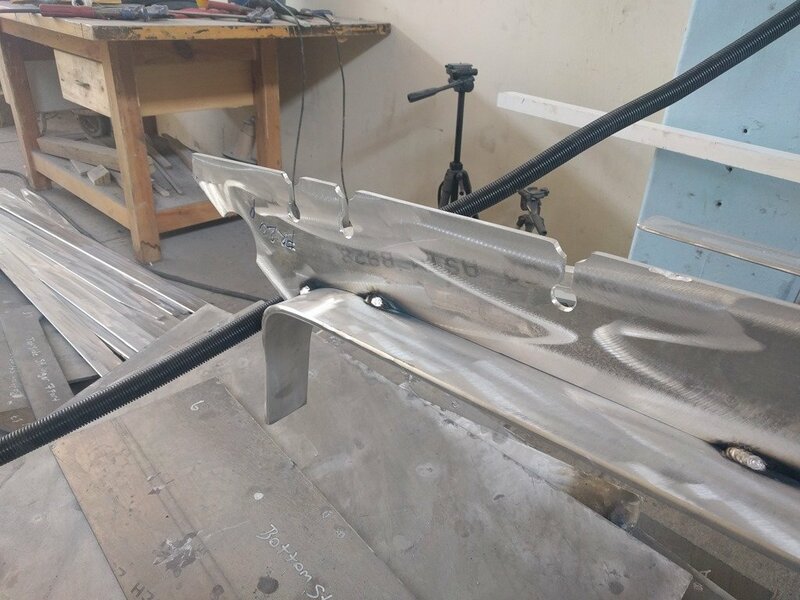 He is clamping that length of 12mm flatbar and will tack it temporarily in place to keep this side plate perfectly straight and will do the same to all the others before tacking the baffles fully in place. This will give you a nice perspective on how the baffling system works. That large vertical slot you can see in the upper center of this photo that is cut into the frame bottom is where the 25mm keel bar runs down the entire length of the hull forming an extremely strong backbone and central reference point for the entire hull. 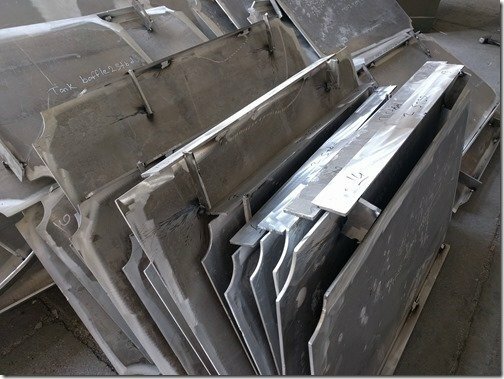 That cavity in the middle is one of two which form the battery box for our mammoth 24v house bank of batteries giving us total capacity of 54kWh. 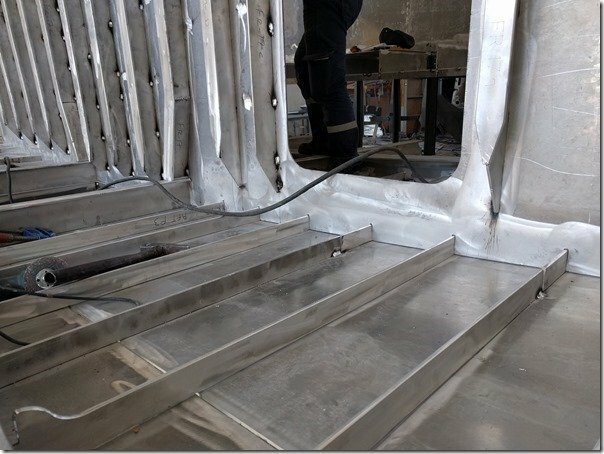 These batteries have a mass of 1320 kg / 2910 lbs BUT it is “good weight” in that it sits as low down as you can possibly get and does double duty as ballast which helps with the ride and comfort at sea and perhaps most importantly part of what makes this hull self righting. This was one of several attributes of our sail boats, all monohull sailboats, which we were not willing to give up. You can now see how these grids of closely spaced baffles very effectively deals with the free surface effect I mentioned earlier. This is where the tank building is at as of quitting time on Friday (May 25th 2018) and you can see how this will progress next week. Burak in the background. Uğur is our “main man” on the shop floor and always busy. Here he is using the big hydraulic press to bend one of the 12mm flat bars that reinforces one of the frames. Check out the video at the end to see him in action. 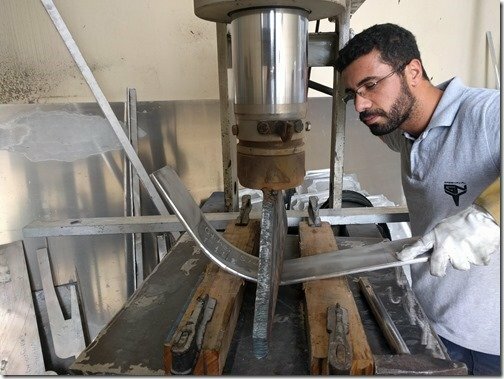 If you look very closely you will see that the CNC has etched lines along the bend where Ugur positions the edge of that steel bar on the press and bends it a bit at each line to create just the right radius and angle of the curve. And another flat bar with an S curve to fit around the frame plate. 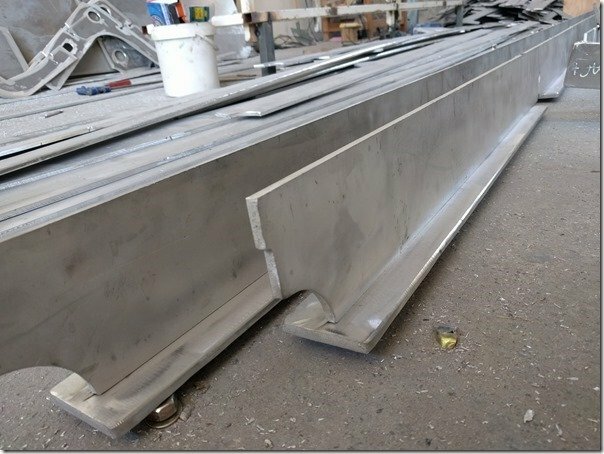 Here is a closer look at one of these large radius flat bars welded into one of the many frames. Which provides a good segue to go check out what’s been happening up at the bow where you will see more examples of these frames. 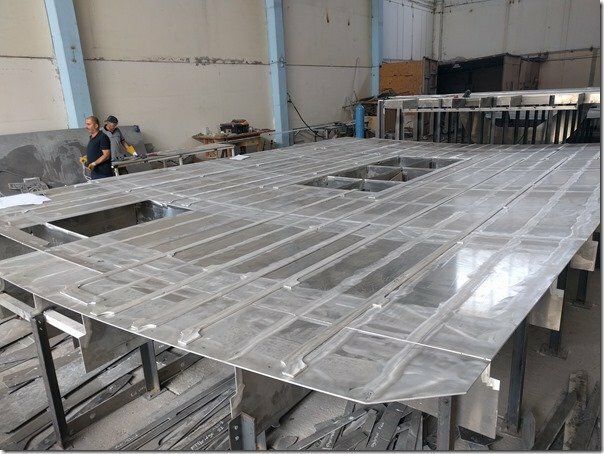 Working our way forward, here we are looking towards the bow from what will be the aft Port (left) corner of our Main Cabin. 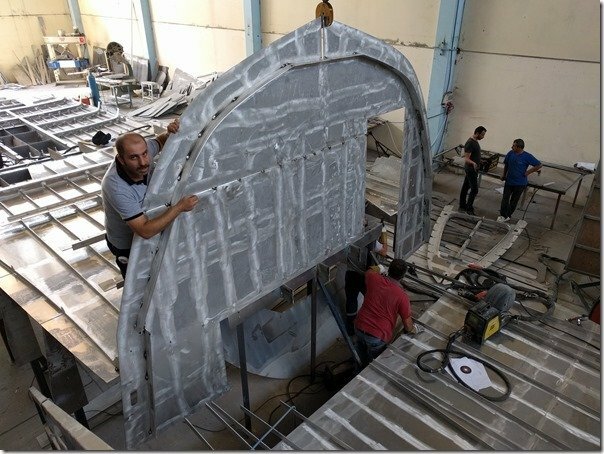 This is the “ceiling” of course as the hull is being built upside down for this first stage and you can see a slightly different construction as Uğur and Mehmet position one of two very robust I beams running down either side of the centerline. 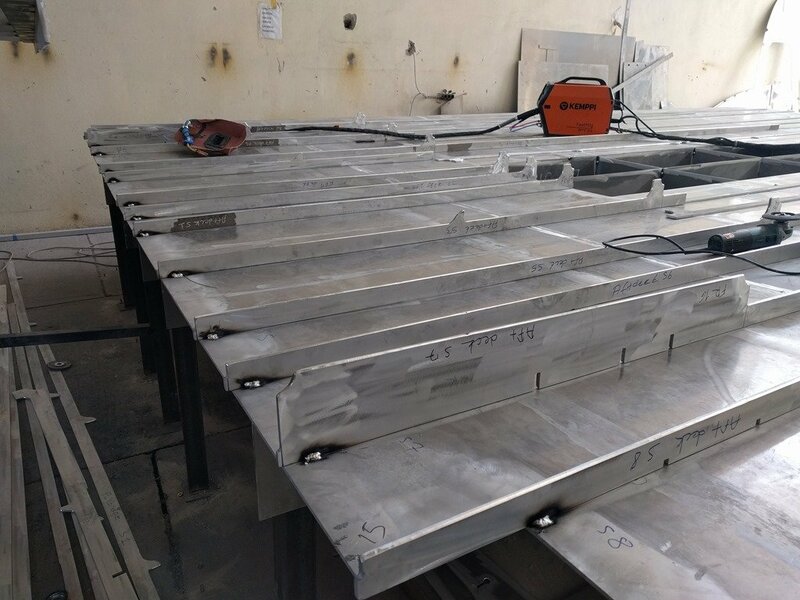 All the longitudinal stringers have been laid in place on the deck plates in preparation for sliding the frames over them to form that interlocking construction you have seen used throughout the deck construction. Not long thereafter it looks like this with the frame tops tacked in place. Looking a bit further forward towards the bow where we are headed next. 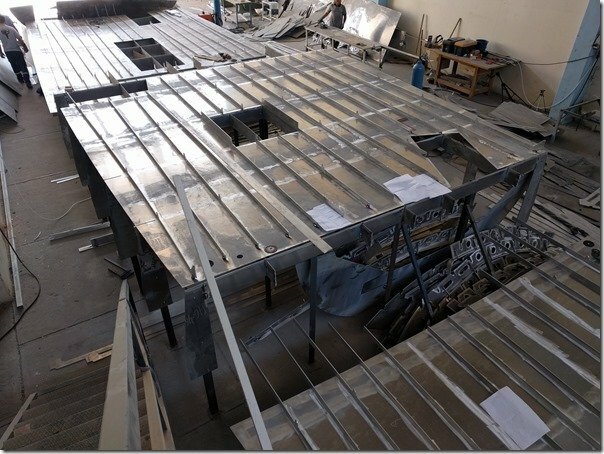 That is Frame #4 which forms the WT Bulkhead between the front of our Main Cabin and the large forepeak storage area. 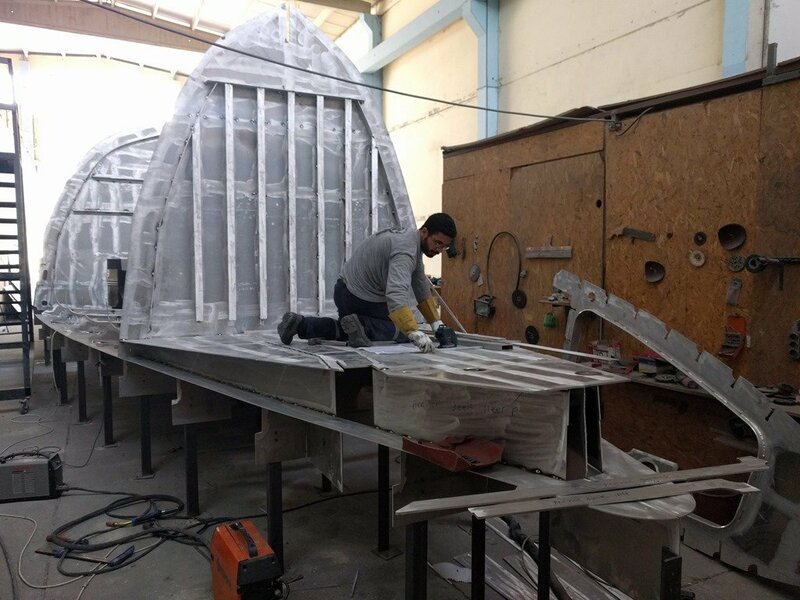 Looking at the other side of this Frame/WTB #4 we follow Uğur and Mehmet forward as they start assembling the particularly puzzle like assembly of different shapes and sizes of plates that make up the deck at the bow. To help orient you with the design of this bow area I’ve grabbed this quick rendering of the 3D model. 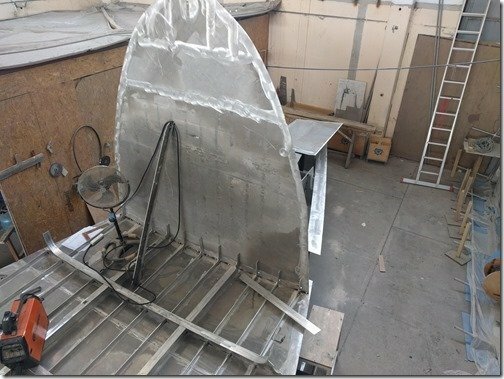 I will go over all the elements of this in a future post but you can see the interesting “sidewinder” mounting for the big solid 125kg / 275 lb Rocna/Manson anchor, the large hatch into the spacious forepeak storage with lid shown both open and closed, the Samson post, cleats, windlass, etc. Note too how the deck drops down and slopes down toward the bow so that all the water and anchor muck drains off easily. Looking at the very tip of the rounded bow at deck level, if you look closely or click to enlarge this photo you can see the red laser they have lined up to show the exact centerline of the boat as the assemble the various pieces and tack them in place. This is the incredibly helpful laser sight unit which projects perfectly straight sight lines in whatever direction you want. SO much faster and more accurate than the old stretched string we used to use. Note Frame #2 on its side against the wall behind Mehmet waiting to be inserted in the appropriate slots in the decking. Stepping back a bit you can see that drop in the hull is nice and deep at the very tip of the bow. 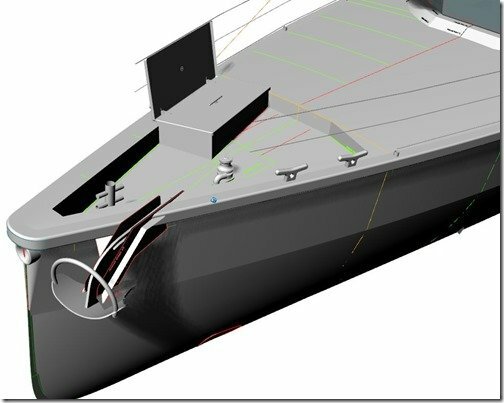 If you look back at the rendering above and the one below at the very end of the bow just below the Rub Rails wrap around the nose of the bow, you can see what I’ve been calling the “donut” which is a very thick rounded AL tube for the snubber line when we are anchored. Dennis did a great job of also positioning this such that it also forms a perfect drain off the deck and back into the sea below. Bow decking plates just about all in place now. Frames #2 Maroon color in the rendering above and Frame #3 Blue, has been dropped in place now. 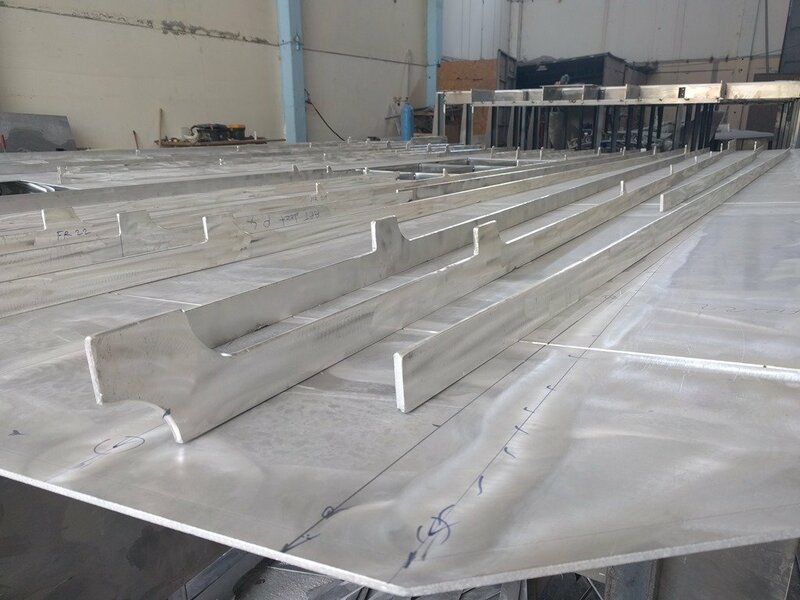 The forepeak storage area runs from Frames 1 to 4 so 3m / 10 feet long and will provide a huge amount of full headroom storage for lines, fenders, anchor gear, pumps, tanks, etc. 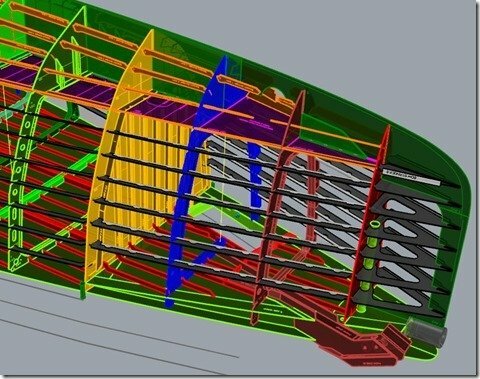 This is one of the slots in the deck plating where the aft cheek plate slides in to form the anchor roller assembly you can see in maroon colour in the renderings above. 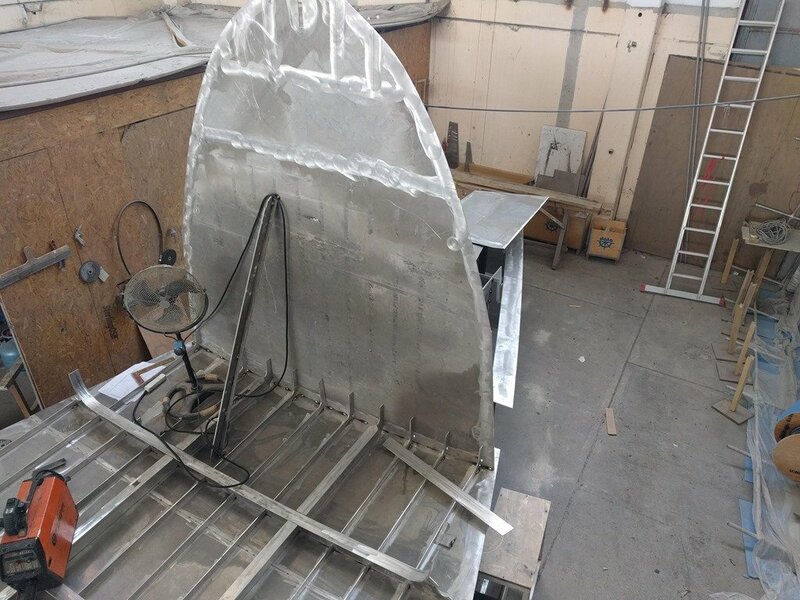 This area is made of thicker 12mm plate compared to the 8mm on the rest of the bow deck to provide an even stronger base for the ground (anchor) tackle and the critically important windlass that brings in the chain and anchor. 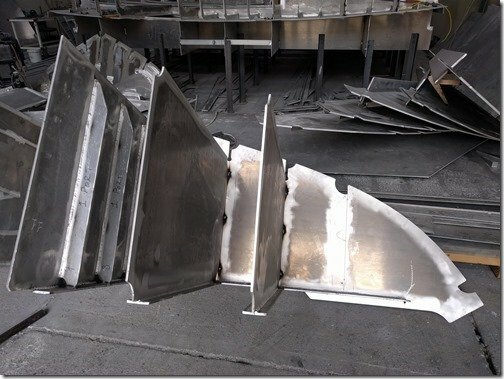 This is one of the 12mm anchor bow roller cheeks anxiously awaiting it’s turn in the assembly process. Look closely or click to enlarge and you’ll see it’s mate plate laying on the floor in the upper right side of this photo. Looking pretty much straight down the CL for where the bow is at as of end of day Friday, May 25th, 2018. 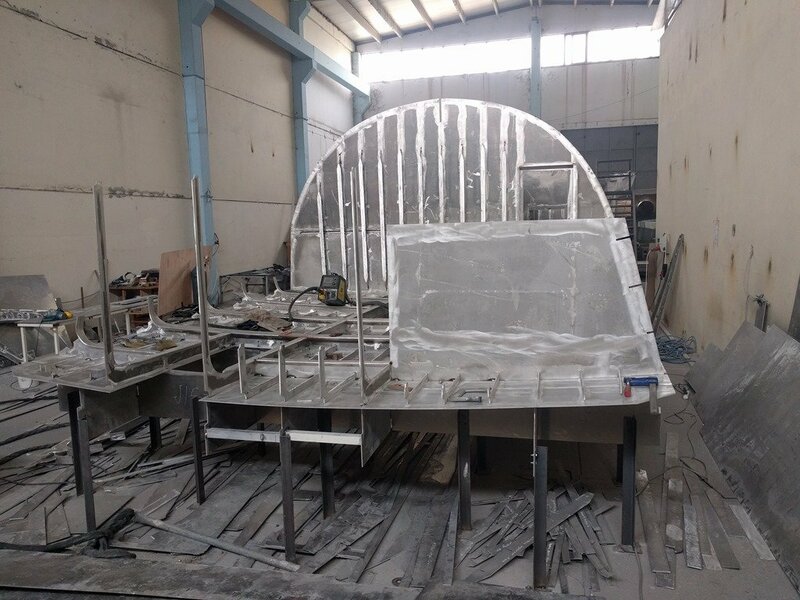 Sticking with Uğur and Mehmet and finishing off strong, check out the top portion of what will become Frame #15 which is where Christine’s Office / Guest Cabin steps up to the Galley area in the SuperSalon. and here it is tacked in place. Whew! Another busy and productive week for Team Möbius and your summary video below as promised. Hope you enjoyed this week’s update and please add your questions and suggestions in the comments section below. Thanks again for joining us, wouldn’t be the same without you! Even in these early stages of the building of our new home, a 24m XPM (eXtreme eXploration Passage Maker) there are stages where the progress is extremely visually apparent such as when all the aluminium or AL plates arrived, when the jig went up and when the deck plates were placed on the jig, there are also stretches where the changes are much less apparent but the progress remains the same. 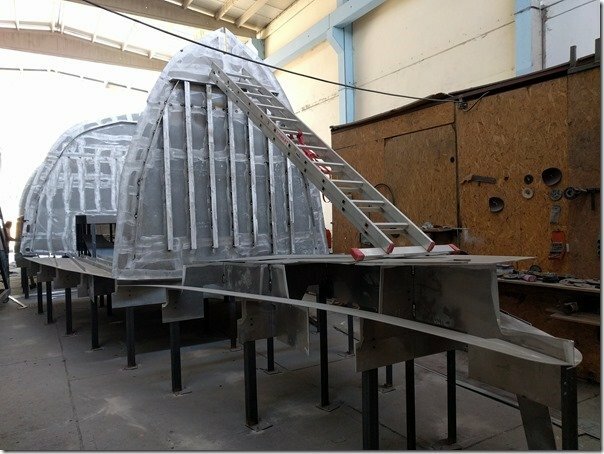 This week the changes are very dramatic as the four watertight bulkheads or WTB were lifted up off the shop floor by a truly eXtreme crane and slotted into place on the deck plates. 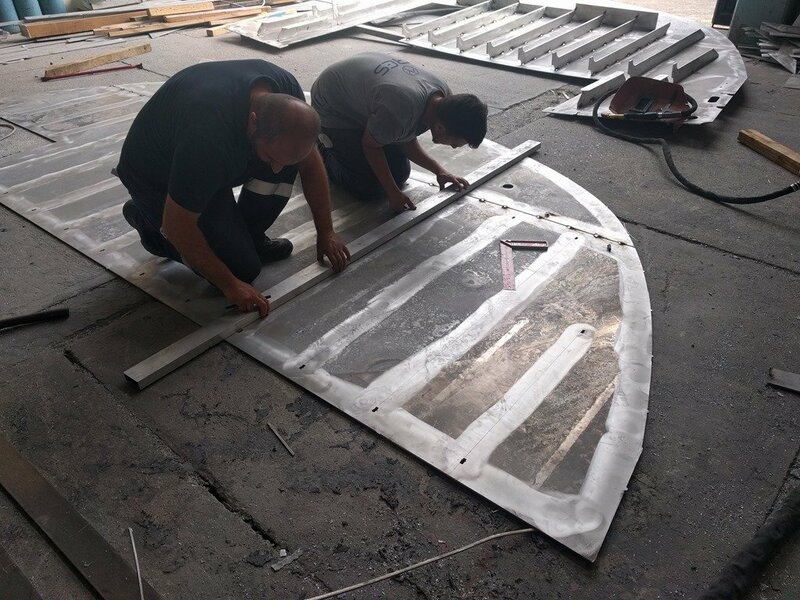 The shape and size of Möbius’ hull continues to come into view with these basic outlines of the shape of the hull and I hope you’ll enjoy this updates on the progress made this week of May 14-18, 2018 here at Naval Yachts shipyard in the Antalya Free Zone. 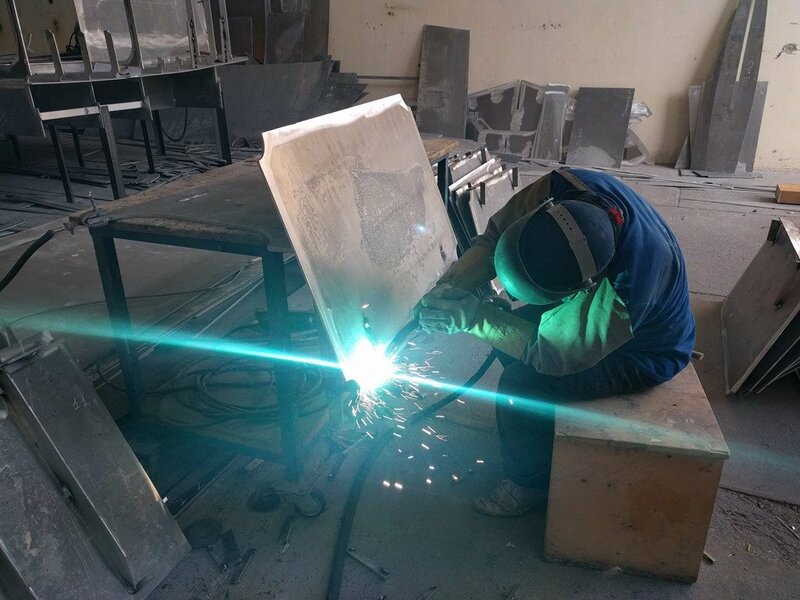 Speaking of the Antalya Free Zone, we receive quite a few inquiries asking about just what a “Free Zone” is and why we have chosen to build Möbius here. 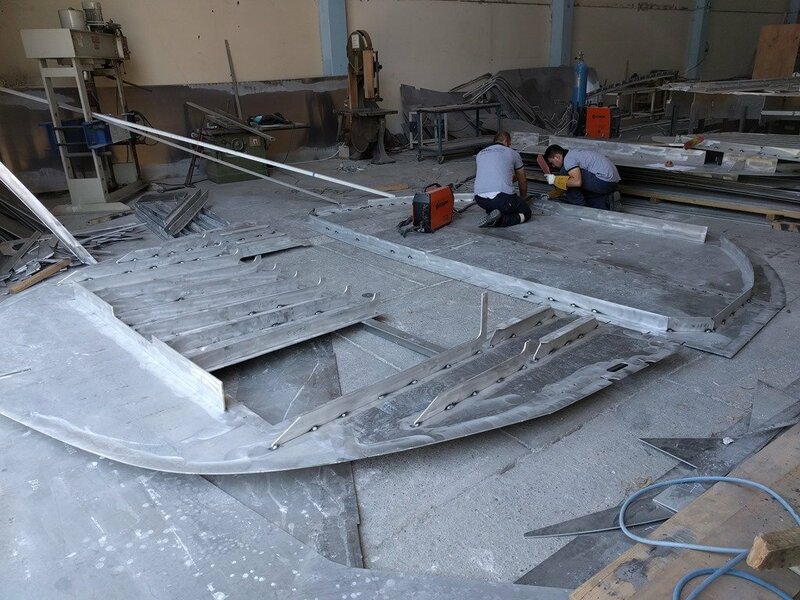 I will do a whole post on this topic in a future post but this post on TRTWorld on how “Antalya Free Zone becomes building hub of luxury yachts” gives a good summary of some of the boats and shipyards here in the Free Zone. I think you will find it well worth 3 minutes of your valuable time to watch. 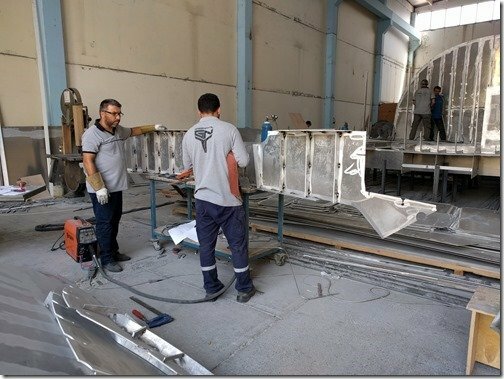 I’m also pleased to point out that the 50m/164ft luxury yacht you’ll see at the very beginning of the embedded video above and in this article, is one of the many yachts which “our” very own Dincer and Baris Dinc here at Naval/GreeNaval Yachts were part of the design and engineering team at Mayra Yachts for this amazing yacht. If you’d like to see more about this 50m beauty, which is at the other end of the spectrum from our “no nonsense” lean & mean boat, Mayra Yachts have posted this video of its launching. One of the other big benefits of working within this Free Zone is that all the more than 60 different ship building companies can share everything from equipment to cranes to many of the very skilled trades people. Most welders for example move from one job to the next once the hull they are working on is finished which typically takes 3-6 months and thus they are able to be fully employed al the time but not always for the same company. 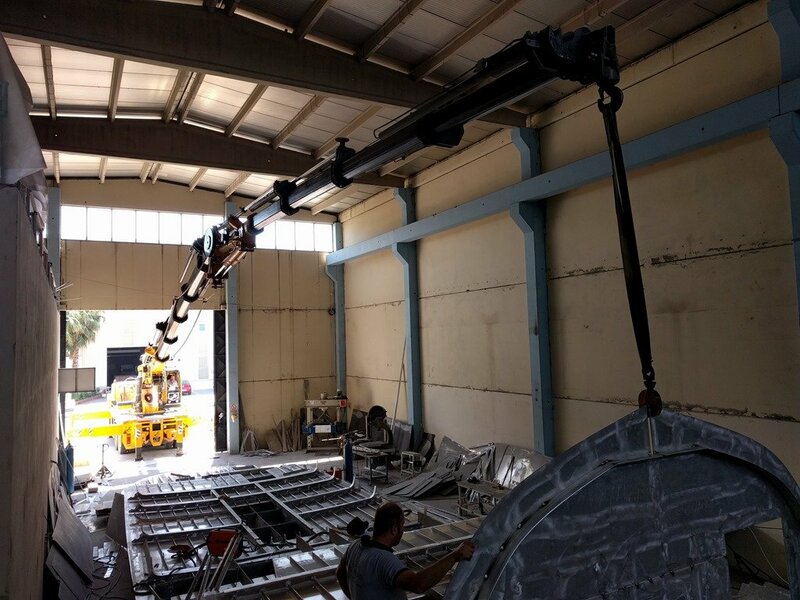 Similarly with just a phone call you can have anything show up within minutes from a forklift to a 100m boat moving machine to the crane eXtremely long crane you’ll see below . 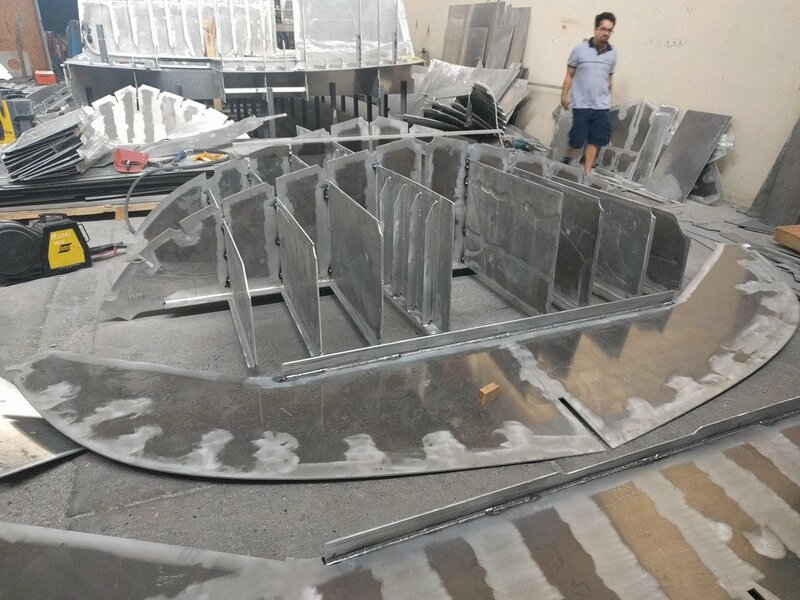 It’s an extremely smart and efficient model and no surprise that this is quickly becoming one of the world’s largest producers of yachts and ships. And as I try to do with each of these weekly updates, you’ll find a video summary of the week compiling the shots I took during this past week. With this week’s video I’ve left all the talking to the video and added in a bit of music overtop of the background sounds from the shop floor. Let me know with your comments how you like this?? Hope you enjoy it all and please don’t be shy about posting any and all comments and questions you have as you join us on this grand adventure. 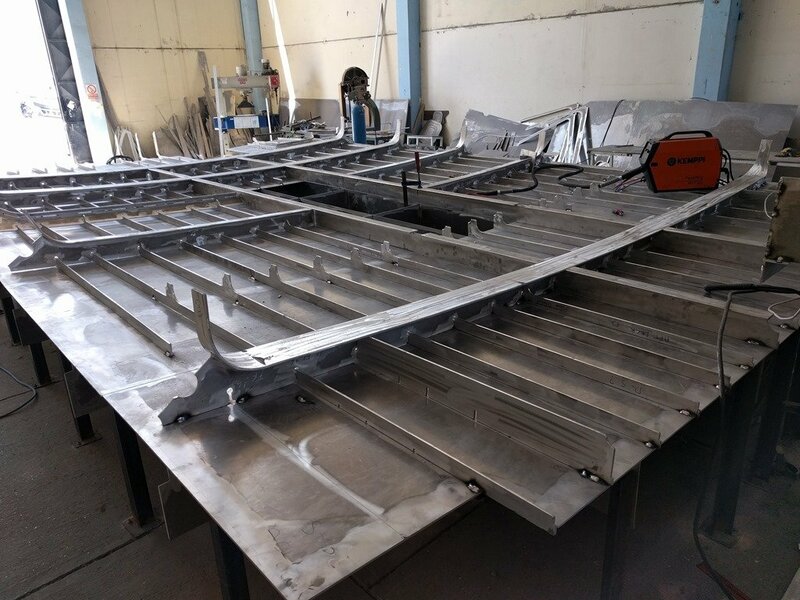 To help make sense of what you are seeing in the photos below as well as future posts of the skeletal framework of the boat coming together, let me provide a few drawings of what the completed framework will look like and the overall layout of the various compartments within the boat’s length. 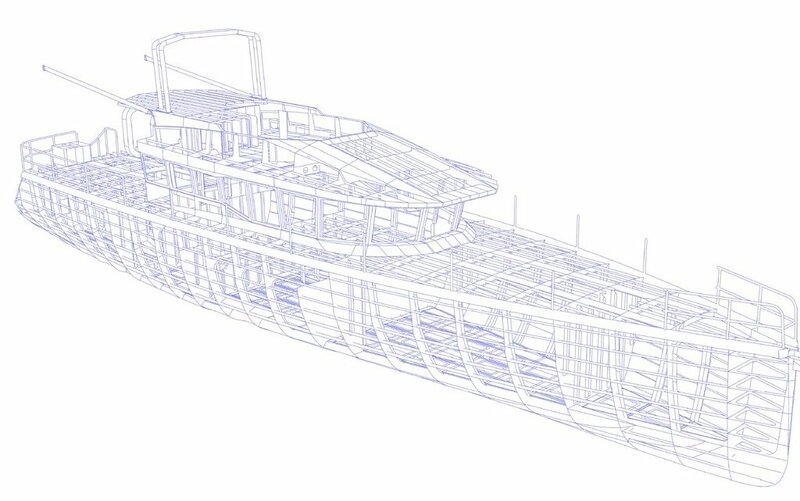 This perspective or isometric drawing shows the complete skeltetal framework by removing the other plates of the hull, deck and superstructure of Möbius. This is what you will see emerging over the next few weeks. 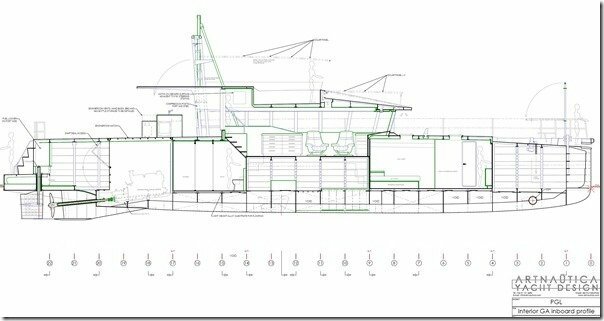 You can clearly see the transverse frames and longitudinal stringers I repeatedly refer to in these posts and you can also see the framework for the above deck superstructure which forms the Raised Pilot House with its 360 degrees of large glass windows. We are calling the area in side our “SuperSalon” as it is our primary living space with aft galley/kitchen, mid dining area &lounge area and the main helm station at the very front. You can also see how the roof of this Raised Pilot House will form the floor of flybridge which I like to call our SkyBridge because it will provide this very open view of the whole world around us and every one of the 360 degrees of the endless horizon surrounding us when doing what we love which is long passages with no land in sight. 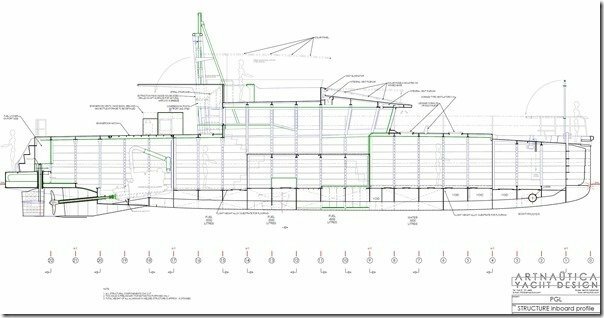 This plan or top view of the hull at just above and just below deck level will fill in a few more details on how the framing works. Take note also of the frame numbers running across the very top and bottom of this drawing as I refer to locations along the length of the boat by these frame numbers. 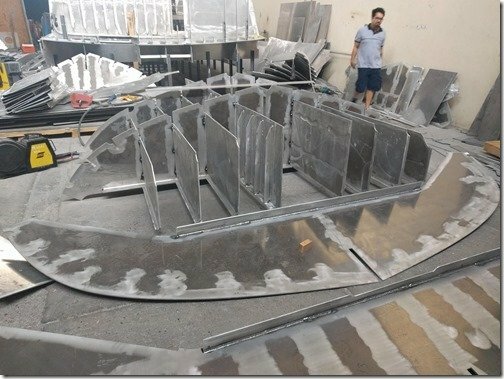 The frames are on 1 meter (3.3ft / 39 inch) centers so the frame numbers also tell you exactly how far away from the bow you are. 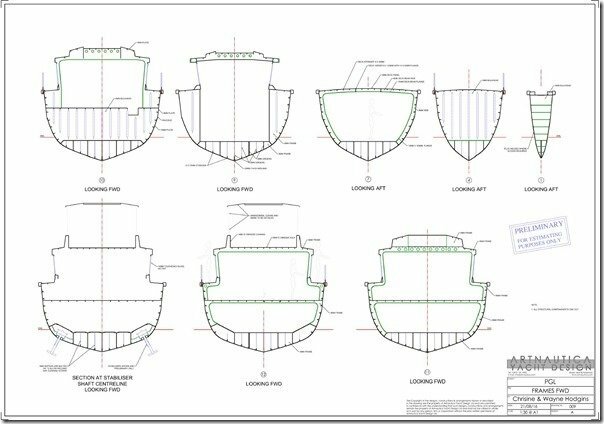 As I noted above, this weeks posting is largely about the Water Tight Bulkheads WTB being installed and if you look over these three drawings you will see that there are five of them alltogether at frames 1, 4, 9, 14 and 17. The very first one at Frame #1 creates a permanently sealed “crash bulkhead” and then four distinct compartments aft of this; Master Cabin, SuperSalon, Christine’s Office & the Guest Cabin, Engine Room and Workshop. 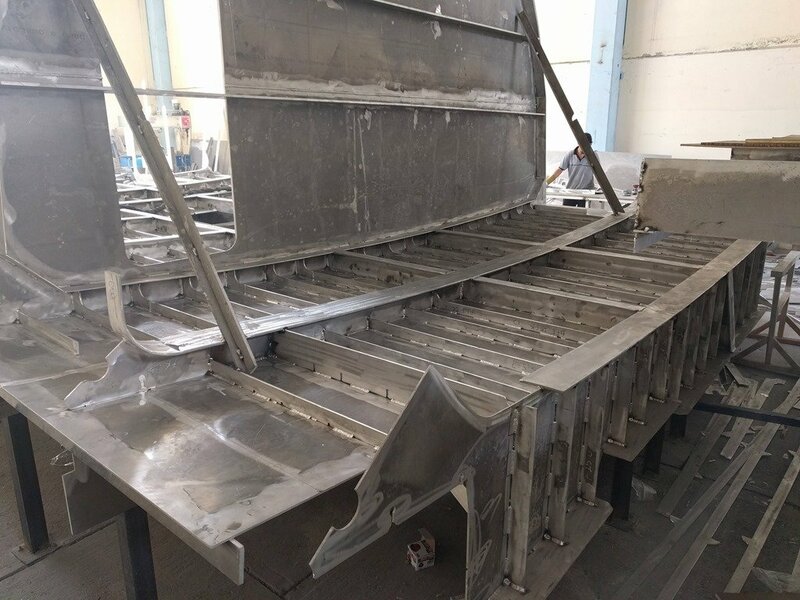 This side view will show you why this is called a Raised Pilot House as the floor is raised about 1.2 meters above the floor level in the forward and aft cabins. We came to love raised Pilot House layouts on our previous boat Learnativity was of the same style but with “only” 270 degrees of glass around both sides and the front. We liked it so much that one of our design criteria we established was to raise this (sorry) all the way to 360 degrees. Learnativity also taught us how having no cabinetry above countertop level was truly a “feature not a bug” in how it added so much volume to the overall room and made it feel much more open and spacious, so you will see this when we get to showing you the interior of the boat. As you look over this side view you will notice several other key features such as how everything below the waterline is welded in fuel/water tanks, how the raised salon or pilot house give us the “down/up/down” layout same as Learnativity had and you can also see how the SkyBridge works and how awemazing it will be to be up there with such an unobstructed and elevated view of the entire world around us. And this centerline section will show you the interior spaces. 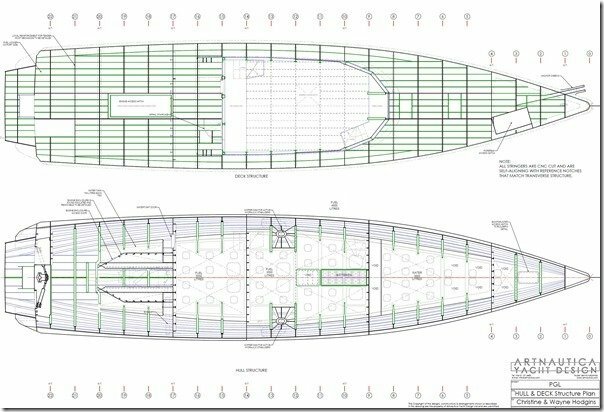 In particular you can see how we have used the “empty ends” idea to give us both a long lean waterline for maximum hull efficiency and yet also be a Goldilocks just right for just the two of us inside. If you click on this drawing you’ll be able to see how the living spaces only run from Frame #4 through 17 which means that out of the 24m of total length only 13m is used for living spaces which is about the same length we had inside our former 52 foot sailboat. 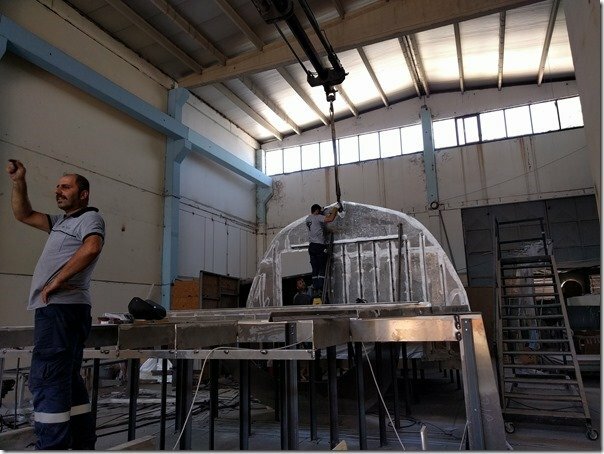 The front foredeck and aft workshop make up the remaining 10 meters on Möbius and this not only balances the boat much better at sea by keeping the weights closest to the center, it also helps to dramatically reduces both our weight and financial budgets as these “empty ends” are not built out. 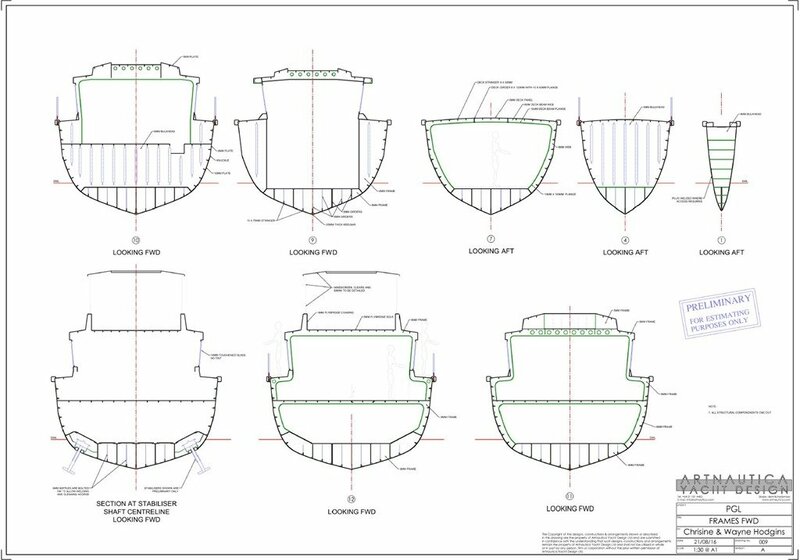 And lastly for this week’s orientation tour, this set of drawings of some of the frames will give you a clear idea of how they are constructed and how the shape and size of the boat changes dramatically as you move forward and aft. 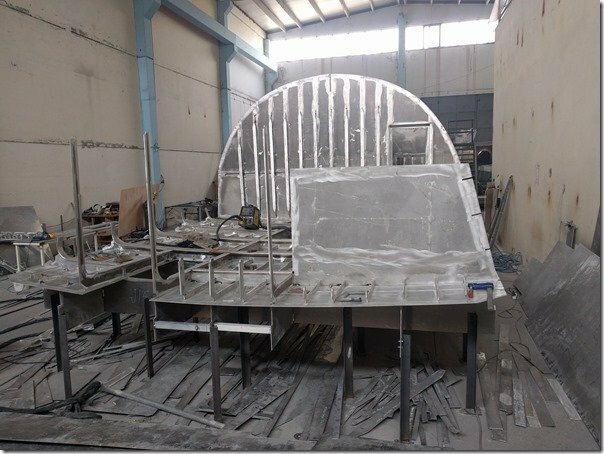 In the top right corner you can see that skinny crash bulkhead at Frame #1 compared to the spacious area for our Master Cabin located between Frames # 4-9 and then the SuperSalon and SkyBridge areas in Frames #11 & 12. OK, now that you are better oriented let’s pick up where we left off last week with this shot looking aft from about the mid point of our Master Cabin at the bottom. Remember to click “invert” button in your head as the hull is being built upside down right now so that raised area in the foreground is the underside of the floor of our SuperSalon aka the conveniently named Raised Pilot House. 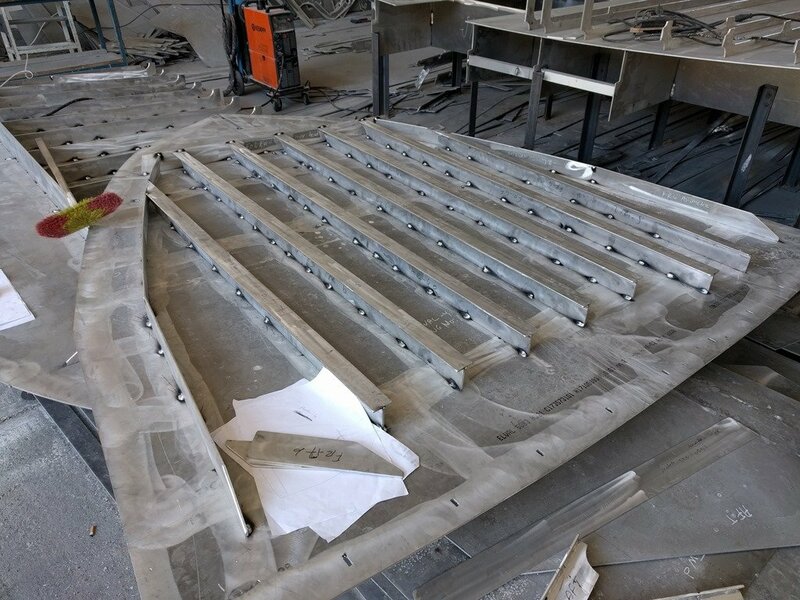 The square opening in the middle is for a large hatch into the huge storage area underneath the whole SuperSalon floor and that angled cutout over to the right is where the stairs wind down into our Master Cabin. One of the other things about a Raised Salon or Raised Pilot House design which I learned to really appreciate on Learnativity was that it created this fabulous space underneath the floor of the raised area. On Learnativity this was a combination Engine Room ER with a stand up Workshop along the Port side but we wanted to move the Engine Room as far aft as possible and not connected to any living spaces. So on Möbius this area under the SuperSalon will be a combination of a cavernous storage area for spare parts and supplies along with a great location for many of the system components such as inverters, chargers, pumps, circuit breakers, etc. I’ve made this area 1.2m / 4ft high so it is just right working height for me sitting down or kneeling very comfortably. This makes installation and maintenance very easy and a joy to work on when you have the space to spread everything out and not have all the “nooks and crannies” which plague most boats. At the top of the photo you can just see all the way to the very stern end of the aft deck and the large rectangular opening is for the hatch overtop of the Engine Room or ER. 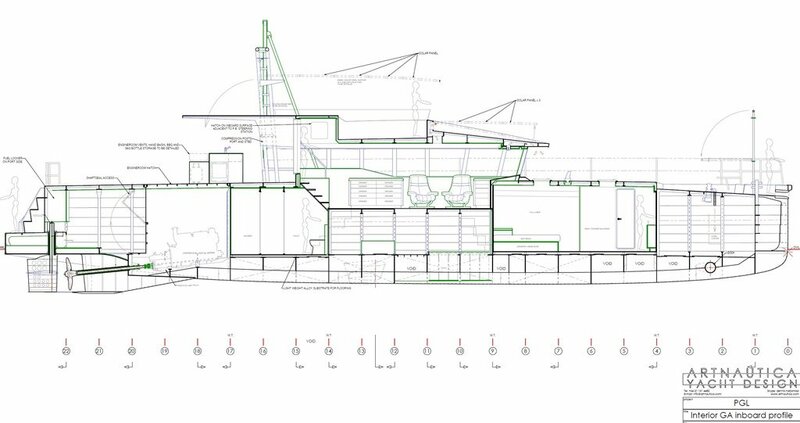 The majority of the area under the aft deck though is for my Workshop which I’m already dreaming about working in. Zooming in a bit you can see how the longitudinal stringers are being readied for laying on the deck surfaces. This shot is looking at the transition from the floor of the SuperSalon and the cutout for the stairs down into our Mast Cabin. Looking forward a bit later in the day at what will become the ceiling of the Master Cabin again, the stringers have been laid out and tack welded in place. 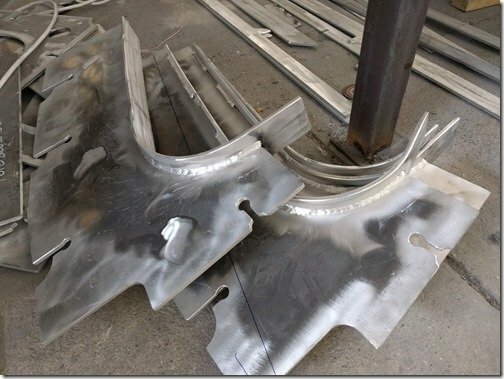 I have been mentioning how the CNC cut parts have been created in an interlocking puzzle piece style and here you can see one example of this with that small rectangular hole in this bulkhead plate forming the slot for the matching sized tab on that stringer or stiffener you see protruding out below. With a tab/slot at each end and others along the way of long runs this makes for much faster assembly as it eliminates most needs for precise measuring and layout and ensures that each piece pretty much has to be in just the right spot. Once everything is lined up the welders can weld the slot shut so everything remains watertight and once ground off you’ll never know this is there. One last bit of detail while we are in zoom mode here, this notch along the edge of one of the bulkheads is for the spot where the hull plates change thickness. 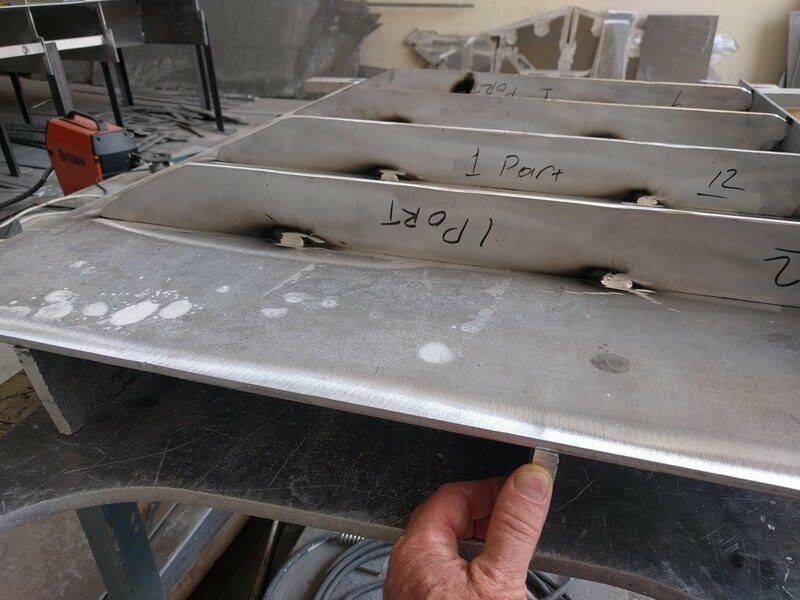 Starting at deck level and extending straight down for about 1 meter the hull the plates are 6mm / 1/4” thick and then increase to 10mm / 3/8” down to above the WL WaterLine then increase to 12mm / 1/2” where the hull gently curves under and joins up to the 25mm / 1” keel bar. At the bow this 25mm keel bar protrudes out in front to form a big solid “bumper” for hitting things and then has a 15mm / 5/8” “ice breaker” section of the hull for back to Frame #4 for the first 4m / 13’ of the hull at the bow. 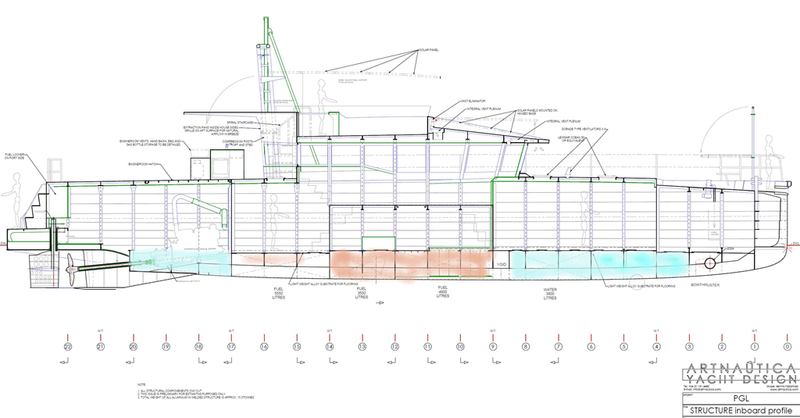 This is WAY over thicknesses the structural engineer and certification authorities require but for Christine and I this is a big SWAN factor for us that lets us Sleep Well At Night and have that mandatory confidence you learn you MUST have before putting to sea. You observant ones will also see how we have tucked the prop up into a bit of a prop tunnel and Dennis has done a masterful job with this and whittled our draft below the WL down to a very svelte 1.3m / 4.2 ft which lets us safely slide into shallow atolls where most other boats, sail or power, would not be able to go. For reference Learnativity had a draft of 2m / 6.6 ft which was very good but getting this down to just over 4ft opens up all the more remote spots for us to go and allow us to have our favorite situation; The only boat in the bay! 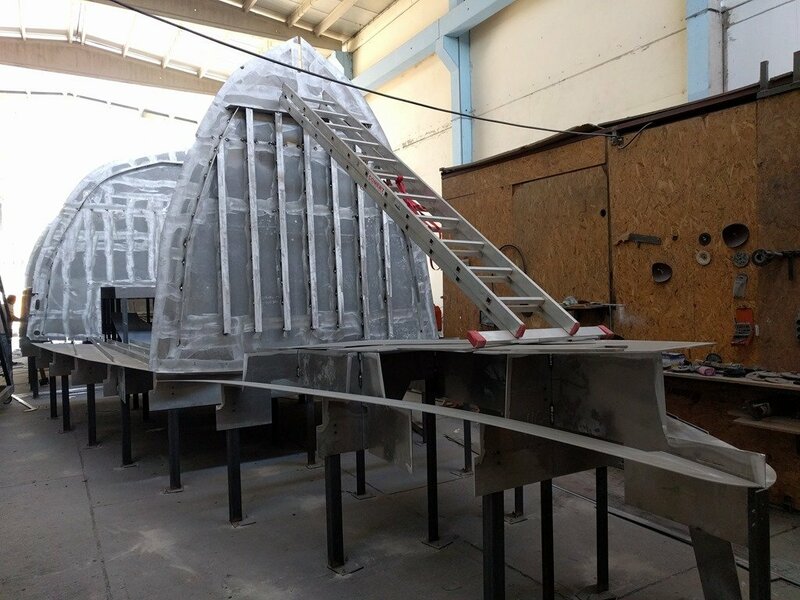 Moving on to the WT Bulkheads finally, let’s to see some of these being built. Here you can see one just getting started as Enver in the foreground confers with Dincer (kneeling) and Ugur. 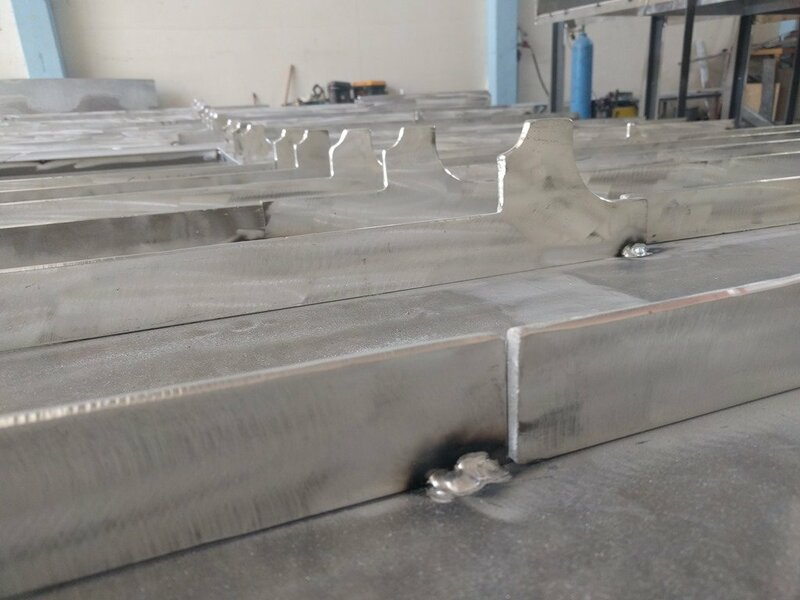 The vertical stiffeners have been welded into the T formation and are ready for locating and welding onto the bulkhead plate. Over to the far left side you can see another bulhead that has already been prepped and is now ready for lifting onto the deck plates in the jig. Stepping back a bit you can now see two other bulkheads being built. 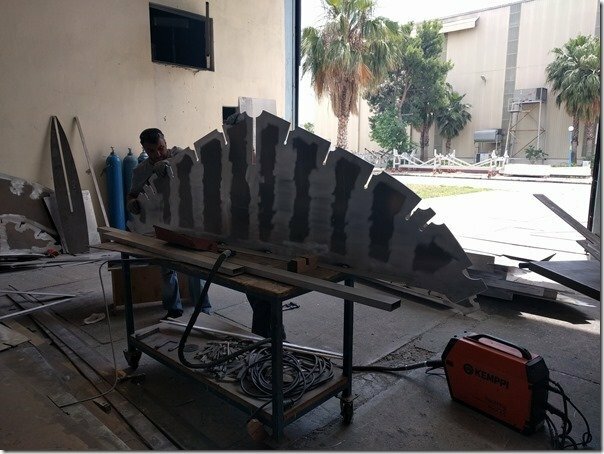 The horizontal bar stock you see is tacked on to keep the plate flat while it is being worked on and lifted into place. These will be removed once the framework is all assembled. Here is WT Bulkhead at Frame #4 pretty much ready to be lifted in place. Some of the many stringers tacked up and waiting to be welded. Similar to how these frame tops are being welded up. 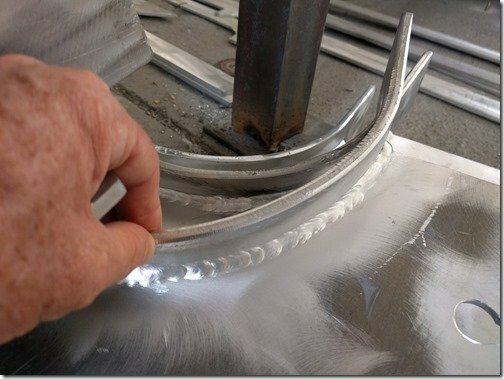 We will see more examples later in this posting but you’ll note how the welds are not continuous but rather laid down in shorter lengths with an equal length gap between them. 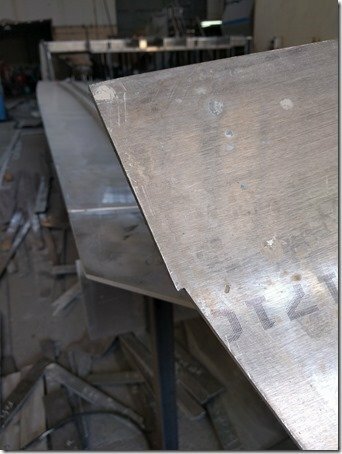 On the other side this same alternation takes place with the welds there being where the gaps are here and vice versa. 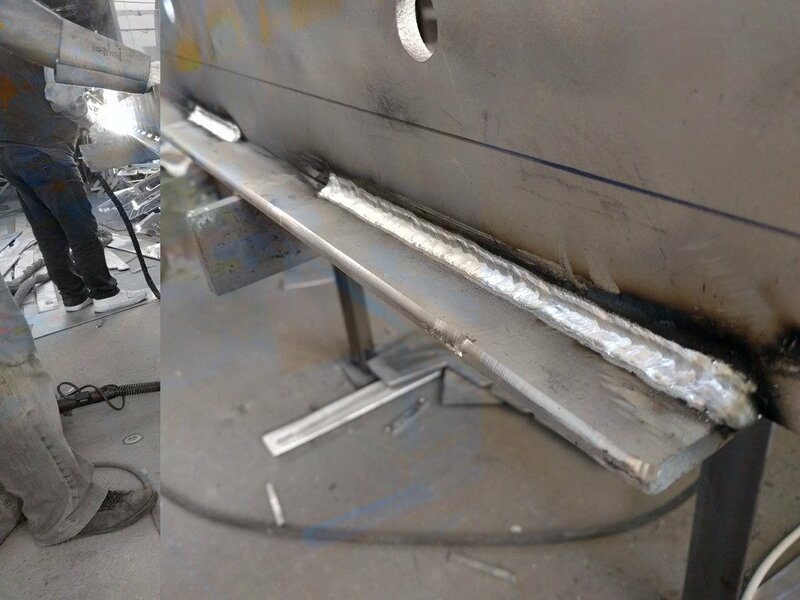 This is to reduce the movement of the AL due to the heat of weldingand keep them nice and straight. 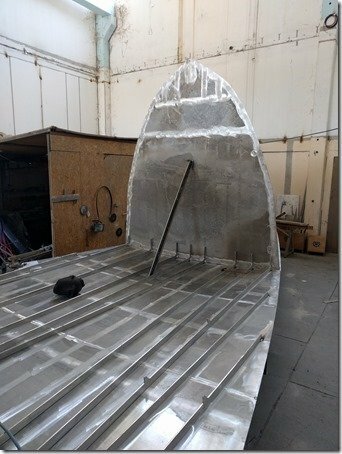 Back to stiffeners on Bulkheads showing how they aer tacked in place to begin with and once in place will be welded fully. 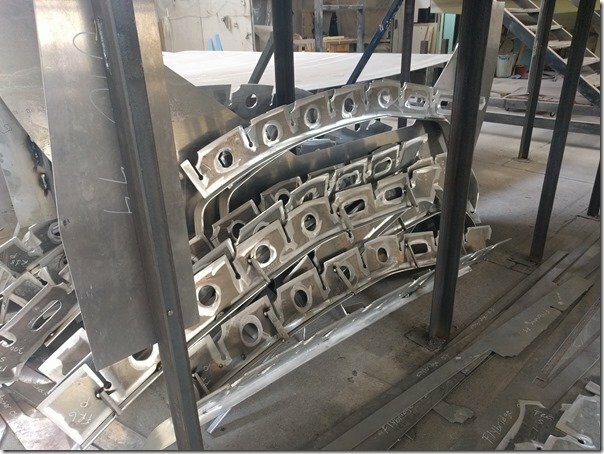 With all the longitudinal stringers in place the transverse frame tops we’ve been seeing in previous posts are now ready to be lowered in place with their slots sliding over each stringer….. Using the same technique we’ve seen previously these U shaped bridges are tacked to the deck plate and then the tapered wedge is hammered into place to force the edges of the frames and stringers to be tight against the correctly curved deck plates and then tacked in place. 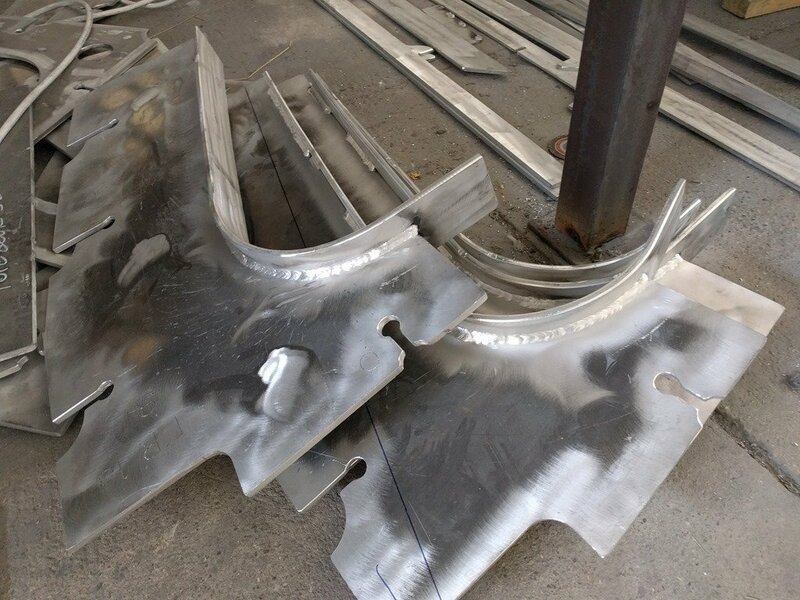 The bridges are then removed and the spots where they were welded are ground smooth and flat. 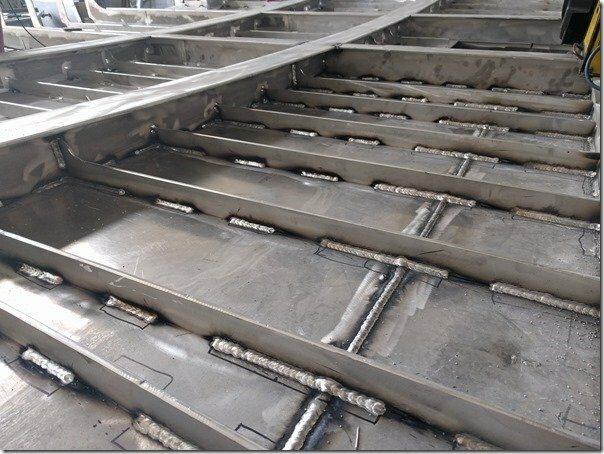 As you can imagine there is going to be a LOT of bridges used throughout the hull building process so you’ll be seeing many more examples of this simple and effective way of keeping all the parts registered tightly and accurately together during assembly. And then THIS guy showed up! Click on this picture to enlarge (works on all pictures) and take a minute to take in just how much reach this crane has. I know I can be wont to exaggerate from time to time but seriously folks, just like Möbius herself this truly earns the eXtreme label don’t you think?? 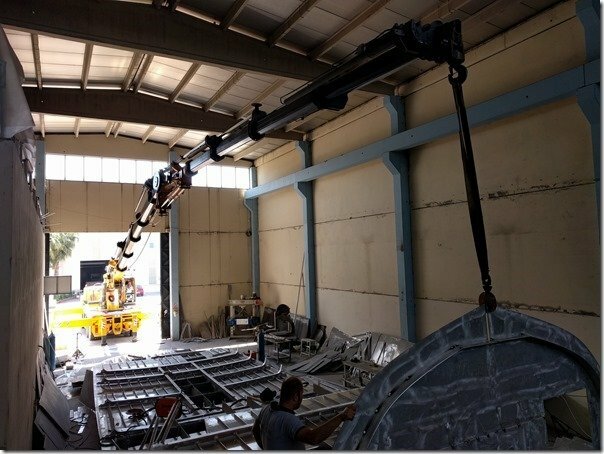 To help you with that, the truck portion of this crane is all outside the building and the building is over 30 meters / 100 ft long and that hydraulically telescoping arm can reach all the way to the far end of the building! Check out the video at the end to see this mechanical marvel in action. Here you are seeing the third bulkhead, Frame #9 being lifted into place. This is the bulkhead between our Master Cabin and the SuperSalon. 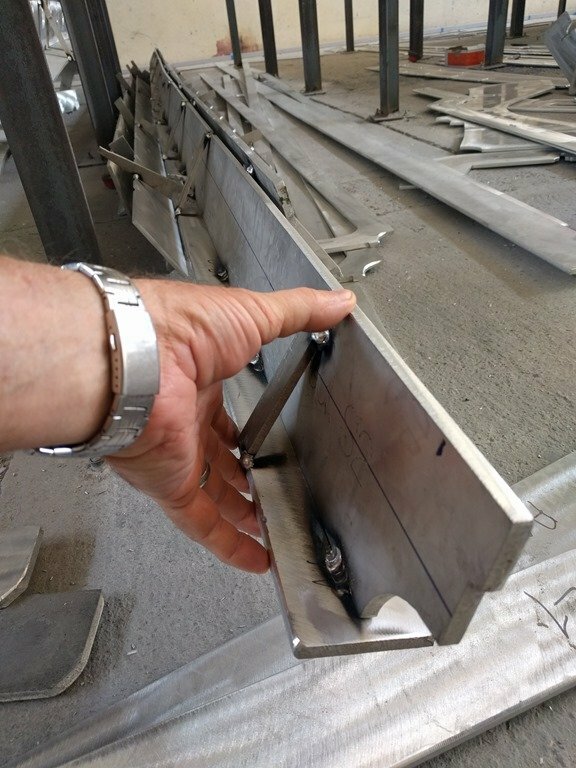 That is a very simple self locking “grabber” on the end of the webbing from the crane which clamps onto the AL plate and lifts the bulkhead up. Here is a shot of the first WT bulkhead at Frame #4 with a diagonal brace temporarily tacked in place to hold it up. Hard to see here but as you’ve just seen on the aft deck, the slots along the top (bottom here) edge of this bulkhead slide over the stringers so everything is keyed together in just the right spot. Bulkhead at #9 being carefully positioned over its corresponding stringer slots before being tacked in place. Continuing the process and now looking forward from the stern this is Bulkhead #14 being lowered in place. Easy to see how this interlocking technique works. Fast, easy and not much room for error. 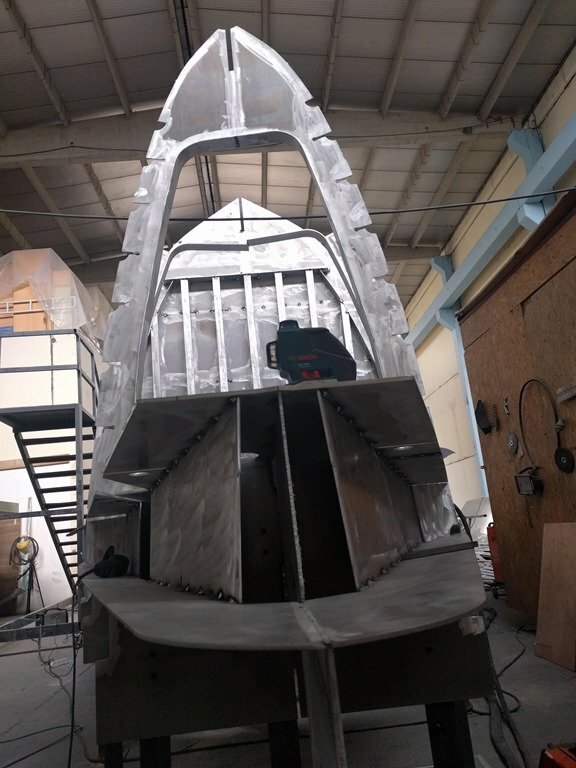 Standing up at the bow and looking aft you can see most of the bulkheads now. The very front #1 bulkhead can easily be lifted into place by hand later and that eXtreme crane was gone as quickly as he had arrived. Gott love being in the Free Zone with such ready access to everything you need to build boats! 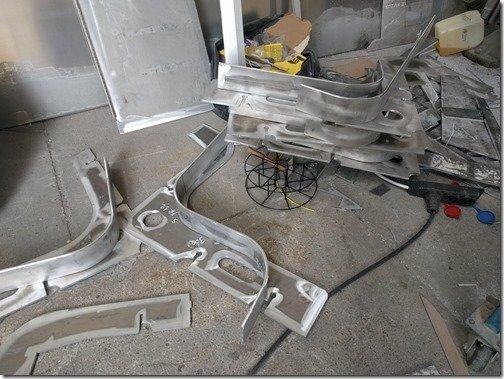 And now some of the final welding can be done in a few places. 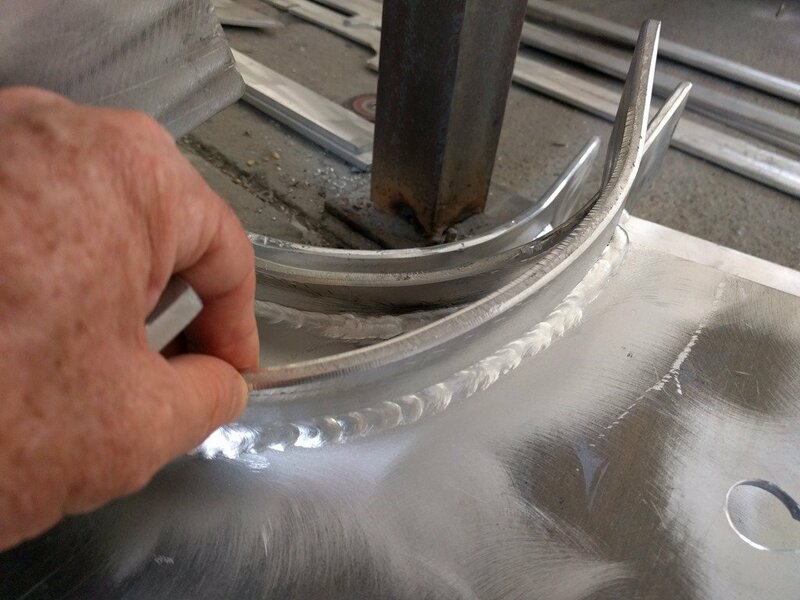 This is what will be the ceiling of the Workshop under the aft deck and you can see that alternating pattern of welds we saw earlier in this post. 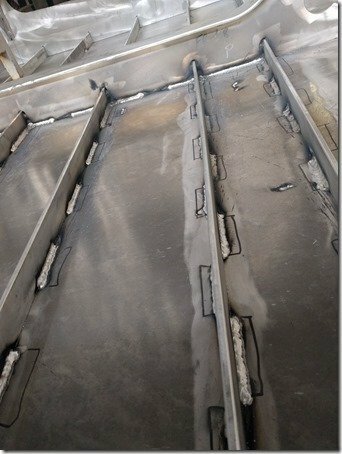 This shot shows how the welds are staggered on opposite sides of the stringers. Here is where we are at as of Friday afternoon. 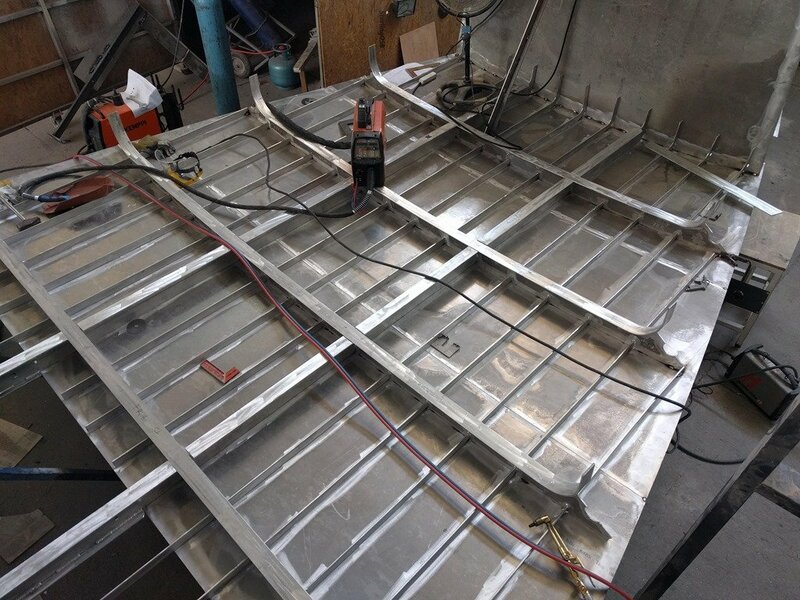 That vertical plate on the right is the inner wall of our hazzardous materials locker that is accessed from the swim step and completely sealed off from the interior for storing fuel, oil, propane, etc. With the bulkheads are all in place now Team Möbius are busy welding the newly assembled parts in place and continuing to prep the next round of pieces in this hugey jig saw puzzle. 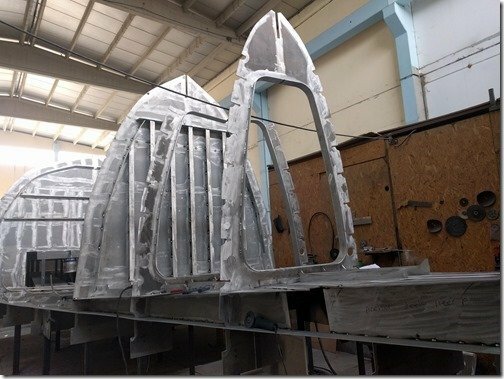 In the foreground is the bottom member of Frame # 21 clearly showing the shape of the prop tunnel at its highest point. 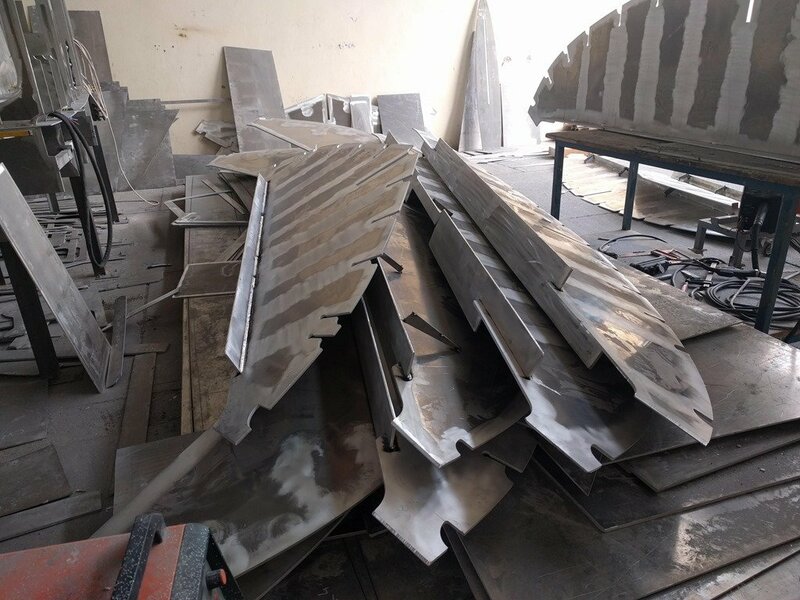 Meanwhile, more and more parts are piling up as they come off the prep table. 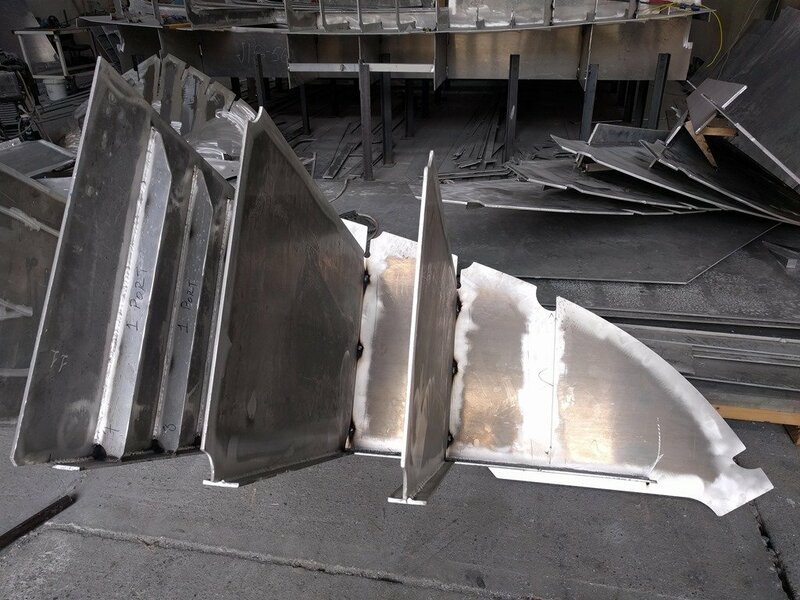 These are some of the many baffles on the inside of the many fuel and water tanks which become integral parts of the hull. With exception of a small bilge area under the aft of the engine and CPP servo gearbox in the Engine Room, everything below the waterline on Möbius is tankage. 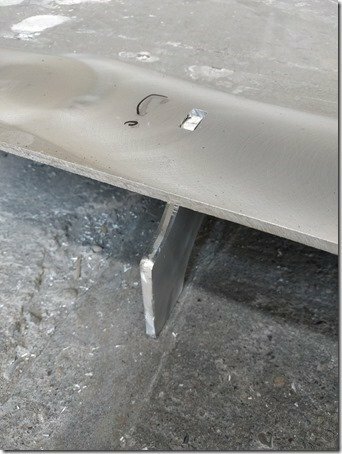 This adds a significant safety factor for us as any penetration of the hull below the WL would only enter a tank and not the interior of the boat itself. Almost no boat is ever truly “unsinkable” but with 12-15mm of AL hull plate below the waterline we are confident that such an event should be eXtremely unlikely. And that catches you up to date on the building of the mighty Möbius. 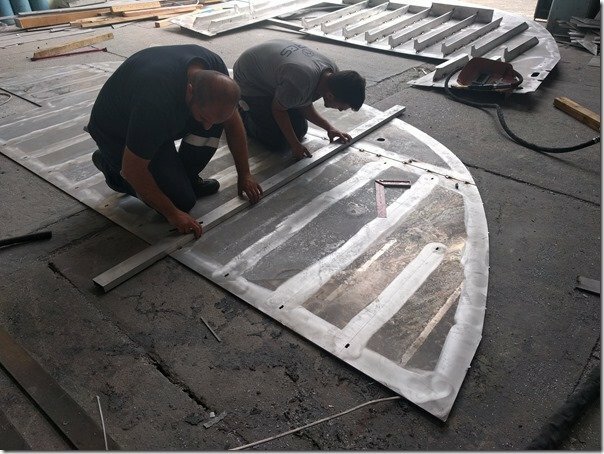 I think you can see more and more reasons why have chosen the Antalya Free Zone for Project Goldilocks and we could not be more grateful to the incredible team of skilled craftsmen that Dincer and Baris have assembled at GreeNaval Yachts. Thanks everyone, see you Monday morning. Here as threatened promised is your summary video of this week’s progress with a sped up version of clips I shot during the week. I’ve left it to the videos to do all the “talking” rather than my narration and added a fun music background along with the background noise from the shop floor. Let me know in your comments if this worked well for you or not and what you’d prefer. And as always, anxious to get any and all comments, questions and suggestions so don’t hesitate to add these in the comment section below. 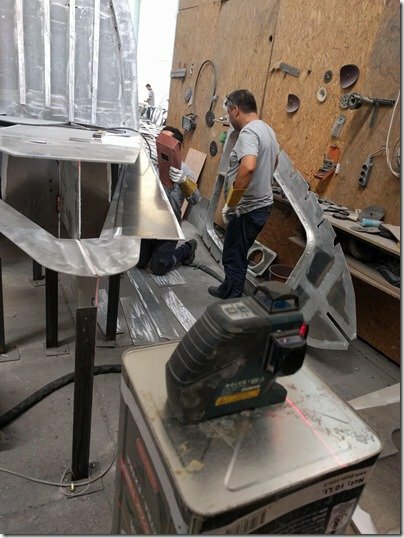 Another very productive week working on the hull of mv (motor vessel) Möbius here at GreeNaval Yachts. Might not be the most visually exciting week but much progress none the less so let me walk you through the week with photos I’ve taken along the way. And there’s the usual video summary at the end as well. 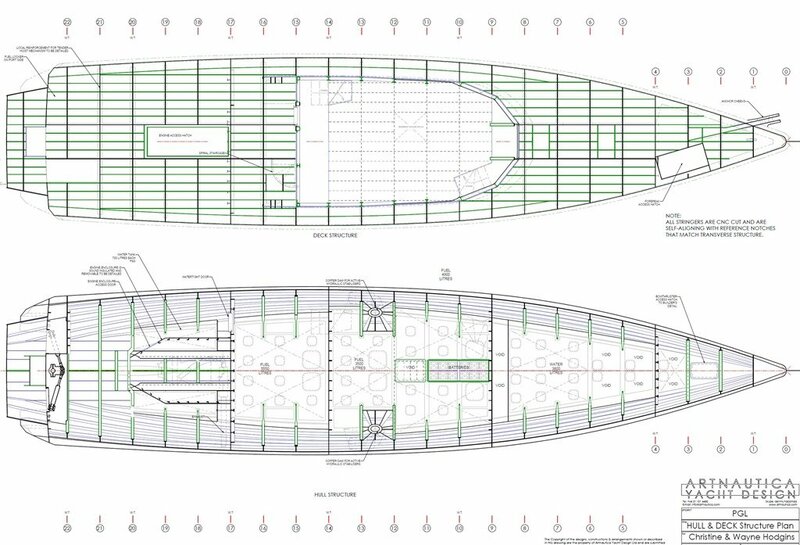 When we left off last week the longitudinal stringers were being laid out on top of the aft and foreward deck plates. This is standing at the aft end of the aft deck which is where the swim step will eventually be and looking forward at what will be the floor of the SuperSalon main living space. 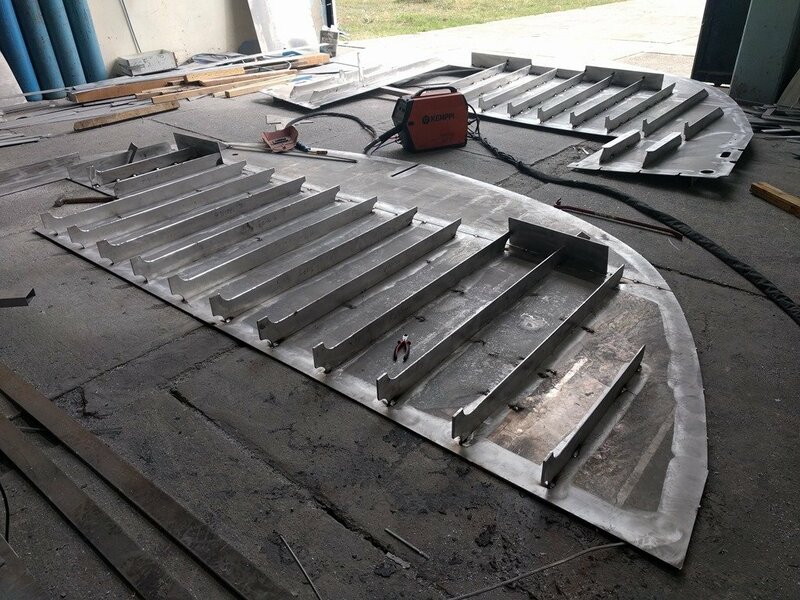 Keeping in mind that the hull is being built upside down this is the underside of the deck plates and so these stringers are running along what will be the ceiling of the boat when you are inside. 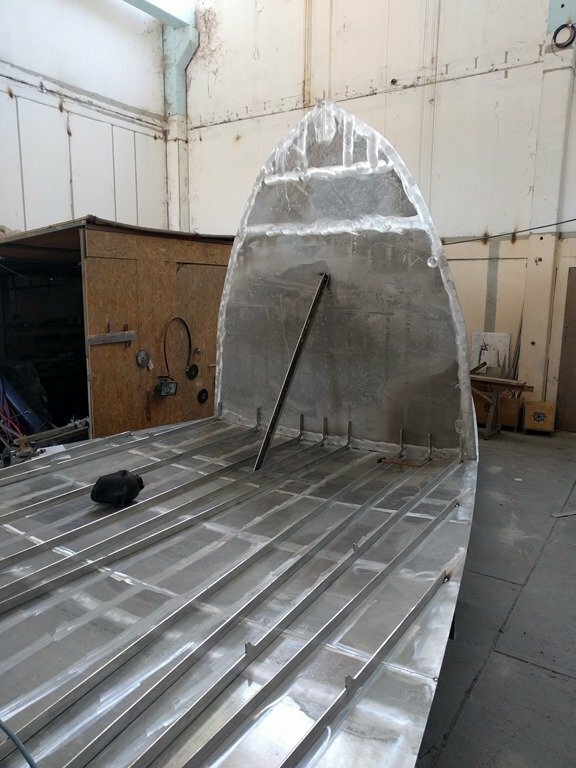 None of it will be visible on the finished boat of course as all the aluminium AL surfaces will be heavily insulated with EPDM rubber glued on all surfaces and around all the stringers and frames. which is placing the top of each transverse frame onto the decks by sliding their slots over each stringer. 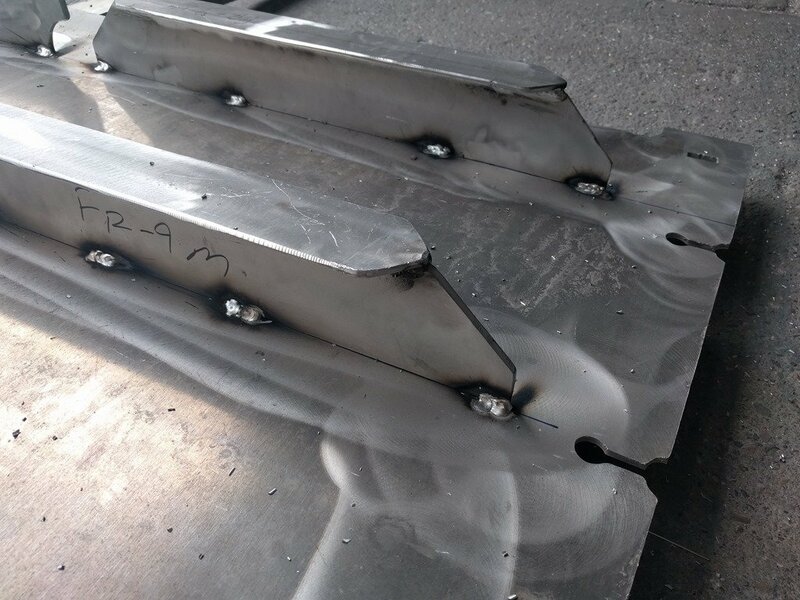 Speaking of the frame tops, they have been piling up all week as the crew has been busy tacking the flat bars onto each top member of the frames. You can see the slots I’m referring to quite clearly in these two shots. They end with a hole to eliminate stresses when the stringers are welded in place and to provide a space for the welders to reach through. 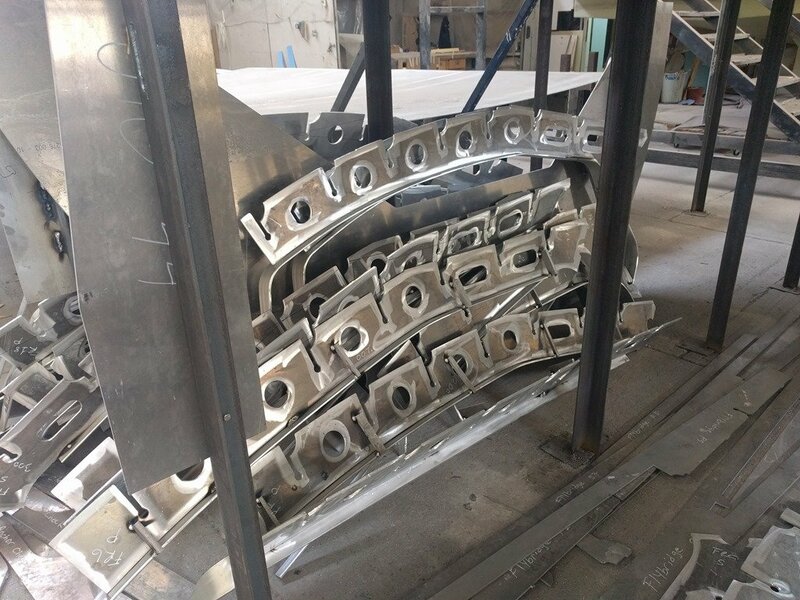 The larger holes you see in this stack of frame tops are “lightening holes” to reduce weight and some also provide ready access for any conduit or plumbing runs that might be needed. However all these plumbing and wiring runs have already been placed in the 3D model and are primarily located in the sides of the frames in dedicated openings in the frames. 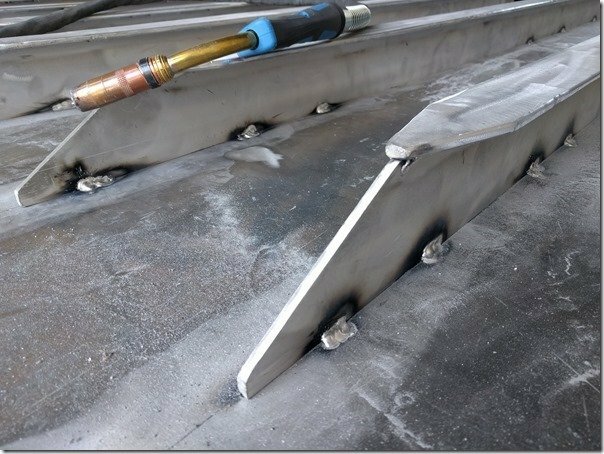 They have also been welding up these T shape vertical running stiffeners which will soon be welded to the AL plates which form the bulkheads that we’ll see next. 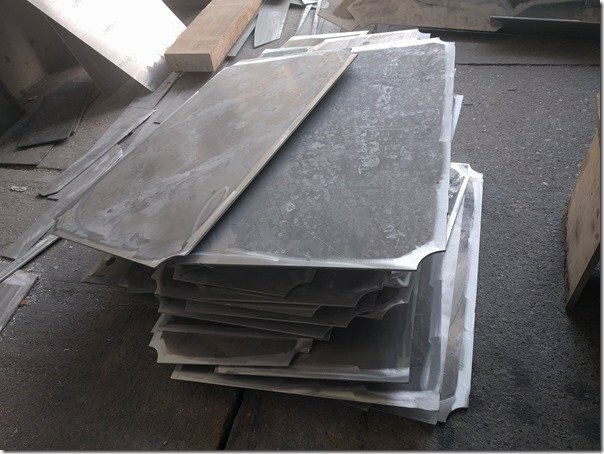 This will give you a sense of scale of these stiffener T’s. The edge under my thumb will be welded to the bulkhead plating and the small bits of aluminum you see between my thumb and forefinger are temporary braces to hold the T sections perfectly perpendicular to each other until they are fully welded once everything is in place. 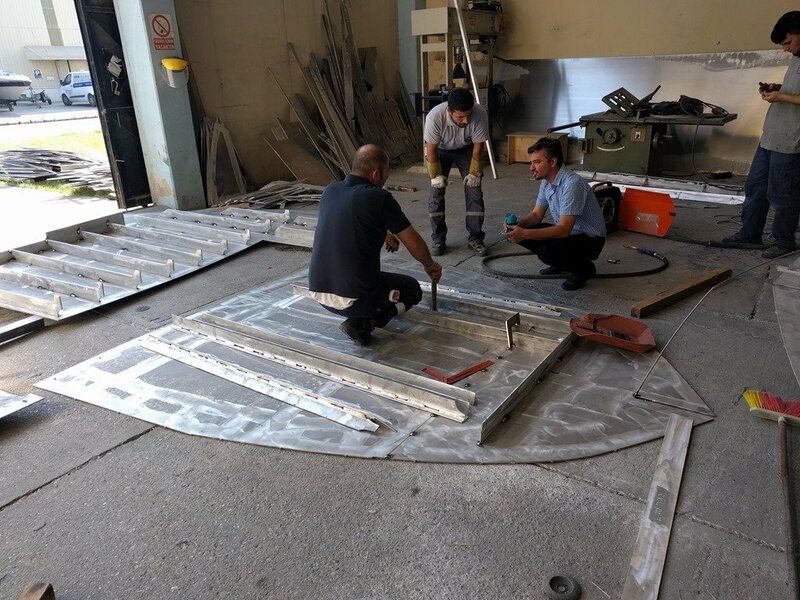 Enver and Ugur are working on one of the bulkheads here and laying out the lines where the stiffeners will be tacked in place. For some reason the CNC cutter failed to etch in some of the guide lines on the plate so they are marking these out with a straightedge and felt pen. One detail to notice here is all the small rectangular holes you can see cut into the plate. 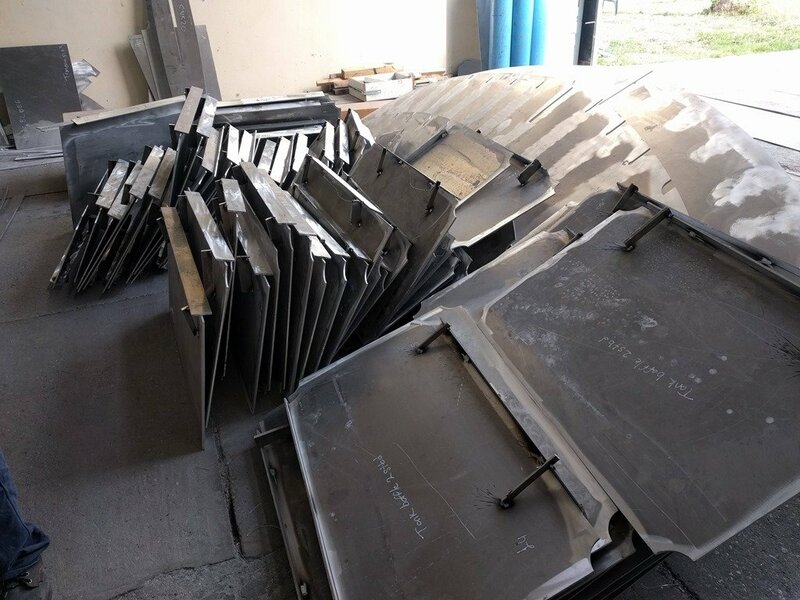 Each of the stiffeners have matching “tabs” cut into their ends which fit into these slots and guarantee that each stiffener is in just the right place. 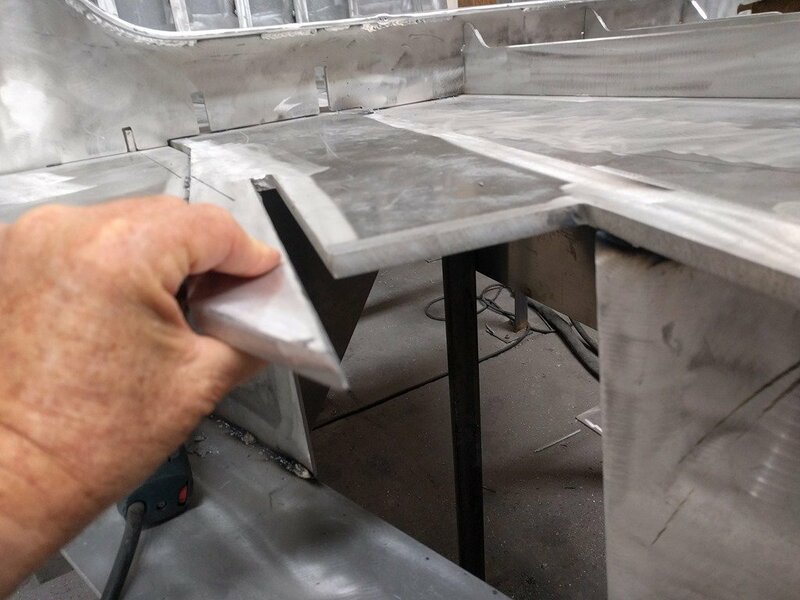 Makes it quite quick and easy for them to connect the edges of these slots with a felt pen line which will ensure that the stiffeners stay in just the right spot as they tack them in place. Here are several of the vertical stiffeners tacked onto one of the bulkheads. 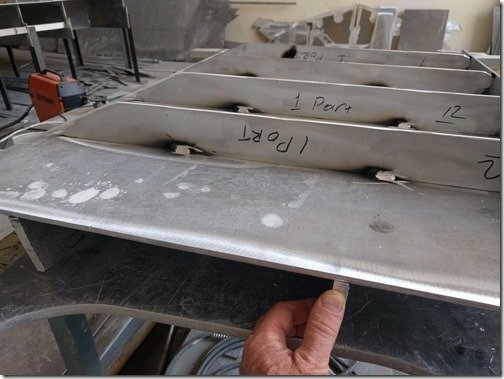 The tabs and slots are under the ends of these stiffeners. 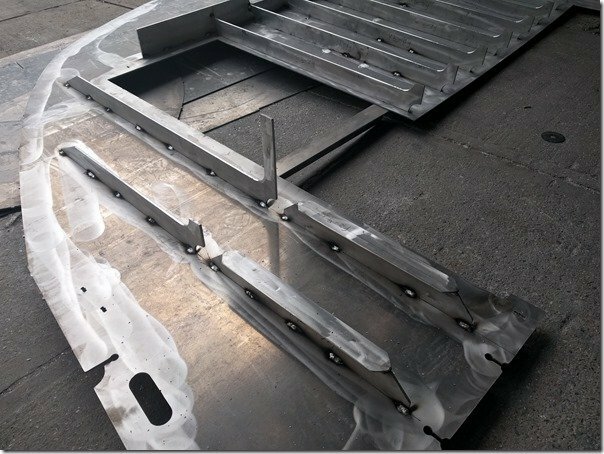 The slots along the top edges of this bulkhead will soon be filled with stringers when this frame is stood up on the deck in the jig. 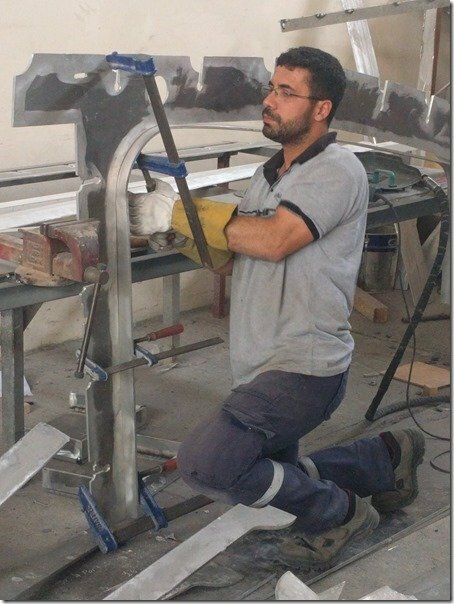 Enver, our Master Welder, is tacking some of the simpler flat bar stiffeners to this intermediary bulkhead. If you look closely at that little arch of aluminium plate you see in front of Enver, (click to enlarge any picture to full size) you will see that he has tacked it onto the AL plate and then fitted an angled wedge piece of AL between the inside top of the arch and the top edge of the stiffener. 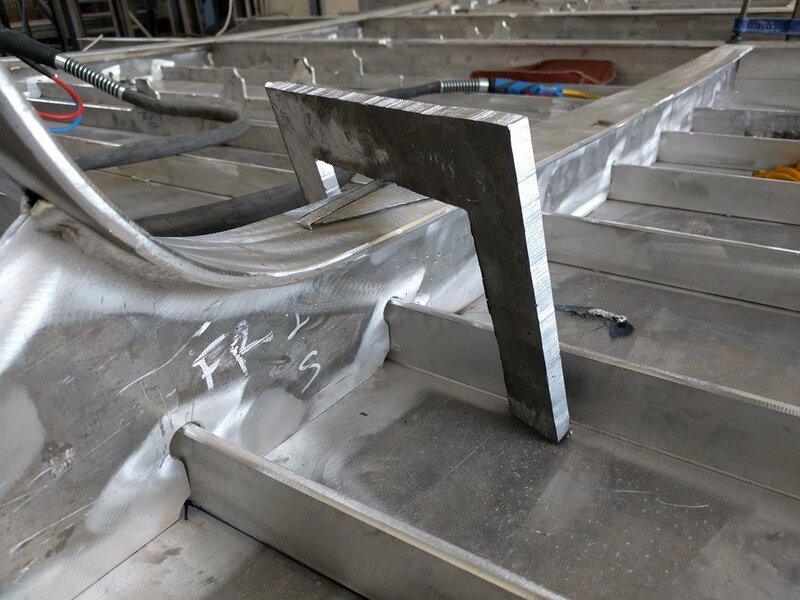 You will see these being used hundreds if not thousands of time throughout the hull construction as this is how you pull two parts tight together before welding to make sure there is no gap. 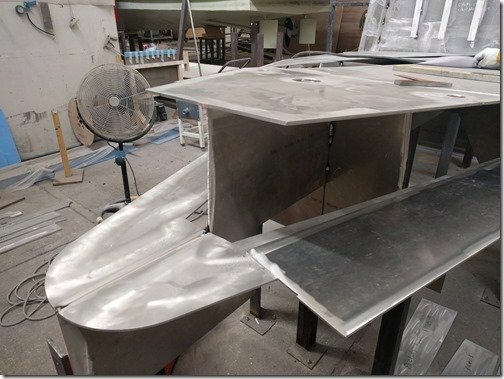 And here is one of the water tight bulkheads with some straight flatbar stiffeners tacked in place. That oval shaped hole at the bottom of the photo is one of those dedicated openings I mentioned earlier where plumpbing and wiring runs will pass through. 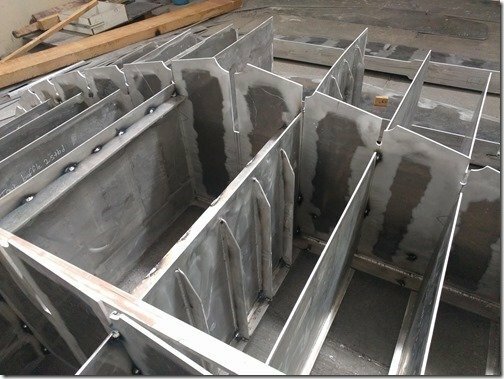 There will be an aluminum collar fitted through each of these holes for the pipes and wires to pass through and because this is a watertight bulkhead these will then be sealed tight with special pass through fittings. Standing back a bit you can see two of the bulkheads with their stiffeners tacked in place. When not helping out with the bulkhead assembly, Ugur is seen here carefully clamping the flat bar stiffeners to this upper frame piece prior to tacking them in place. The large radius in the flat bar has been bent to shape in the hydraulic press using guide lines etched onto it by the CNC plasma cutter to show where the bend starts and stops. 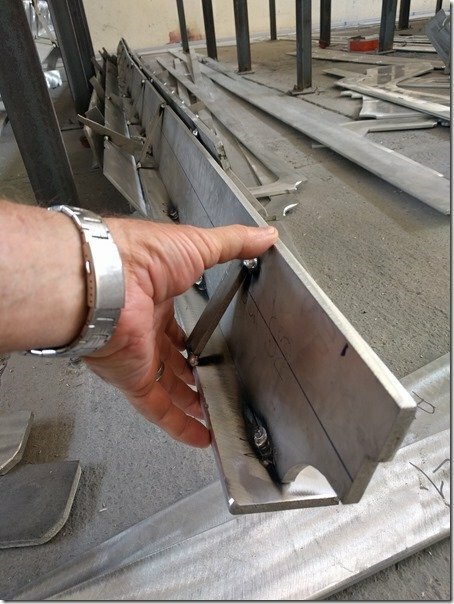 One of the many frames with the stiffener flat bar tacked in place …..
………. and added to the the collection forming under the jig. 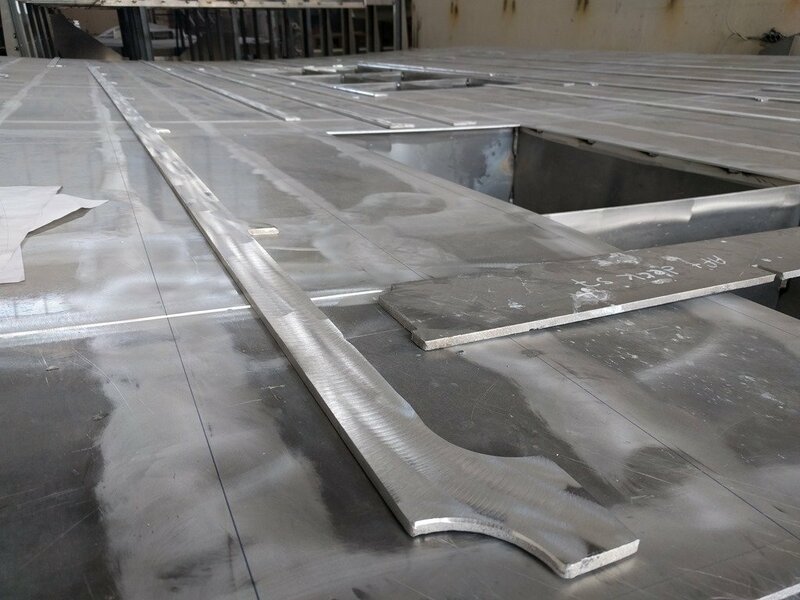 You will notice how the stiffeners are run long, going past the miter joints of these top members of the frame where their vertical pieces will be welded. 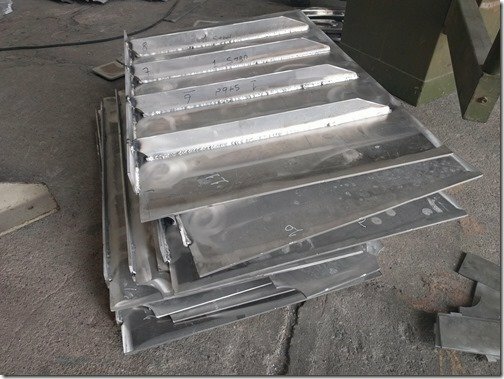 This ensures that no two welds line up with and increases the strength that much more. 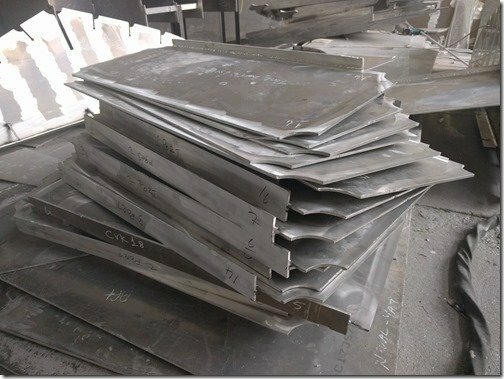 Most of the frames and stiffeners are made of 10mm plate. And that brings you up to date with our progress through April 11th, 2018. Here’s a short video summary of the week that will give you an additional perspective on the week. Thanks VERY much for joining us and don’t be shy about asking questions and suggestions by commenting below.